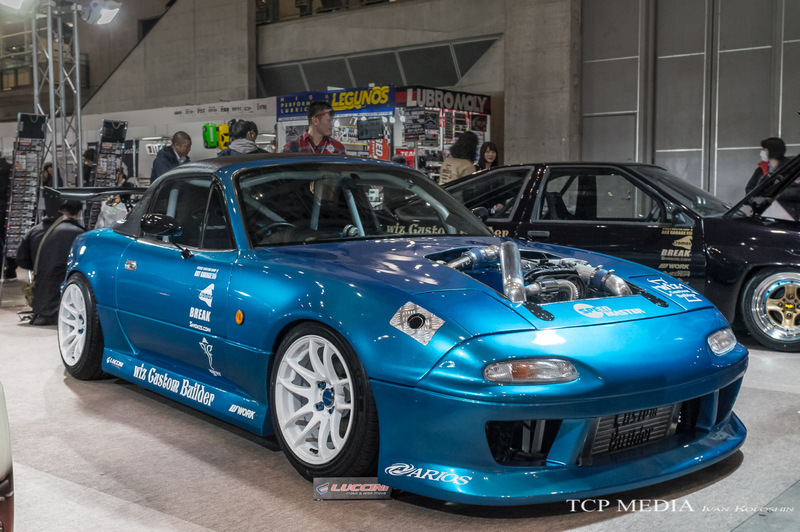 Well that depends. 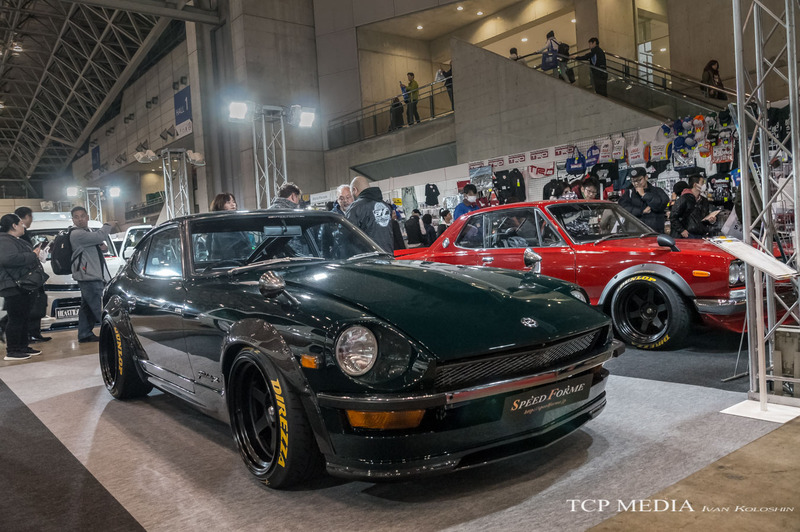 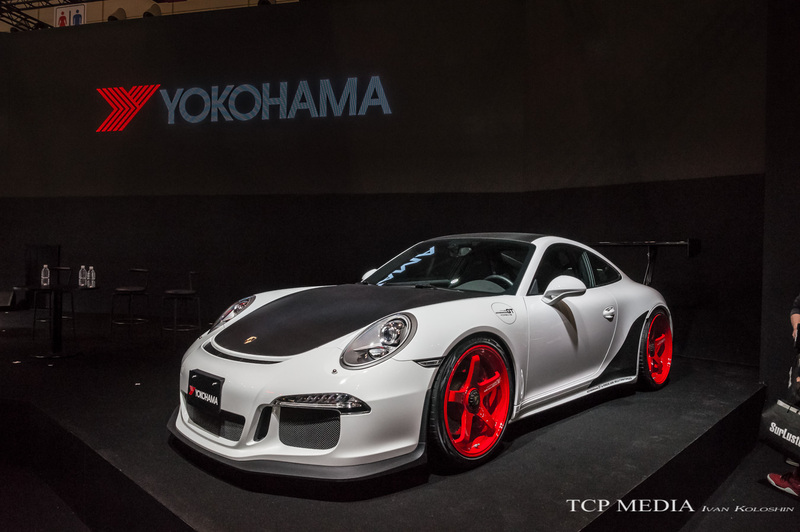 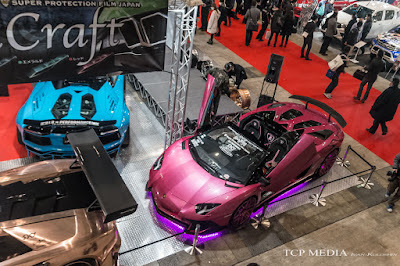 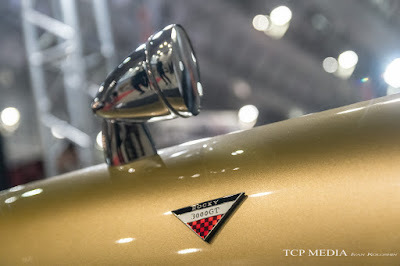 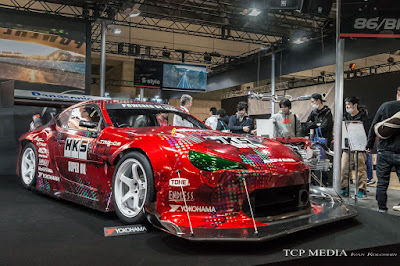 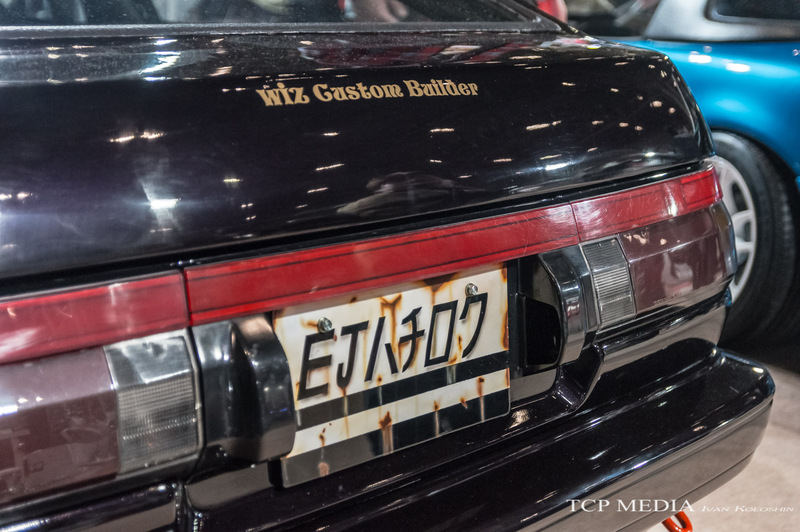 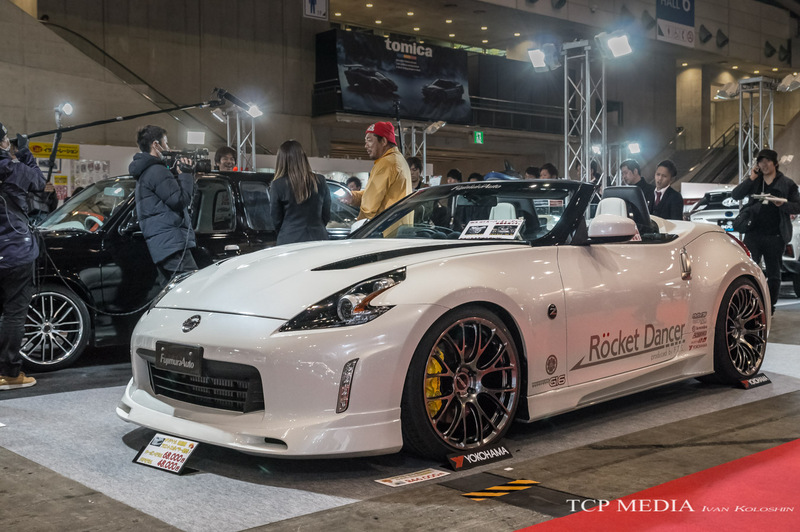 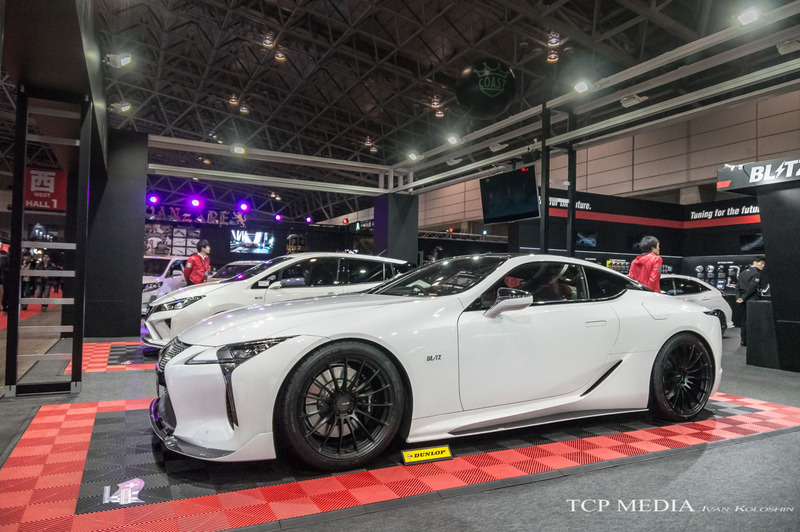 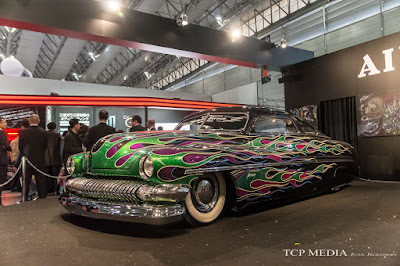 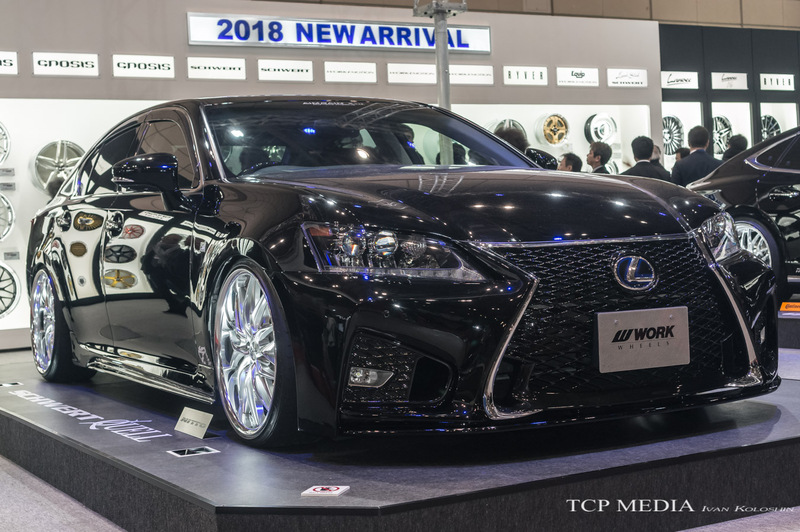 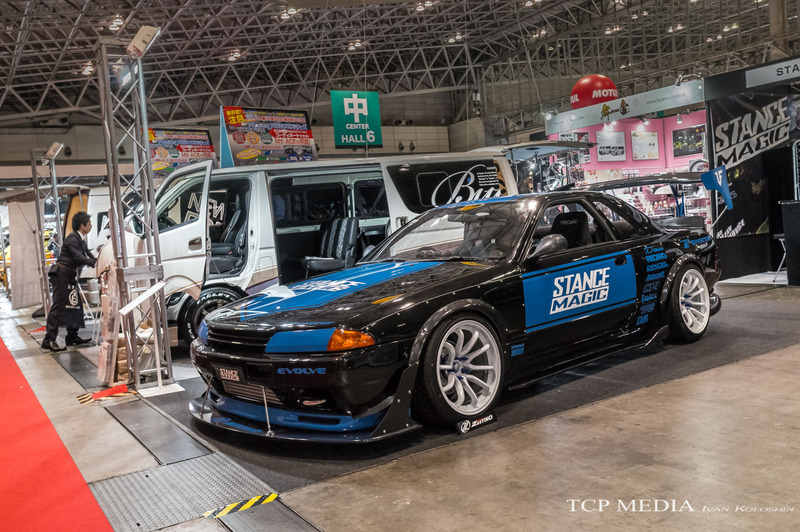 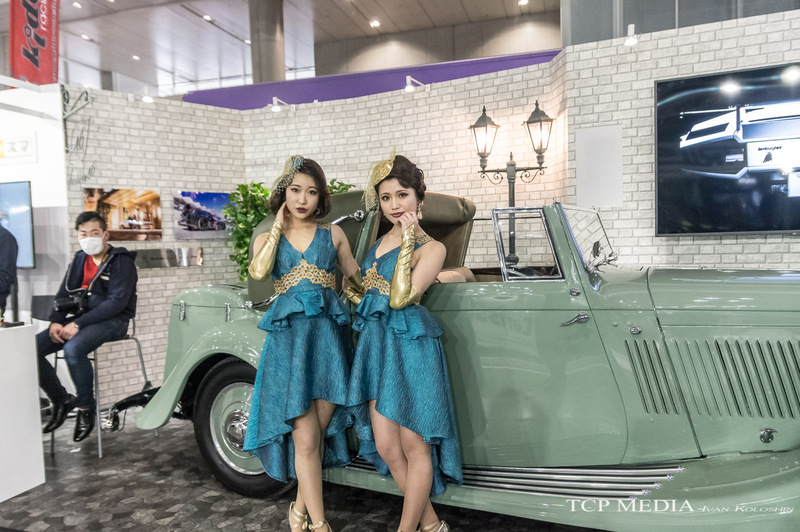 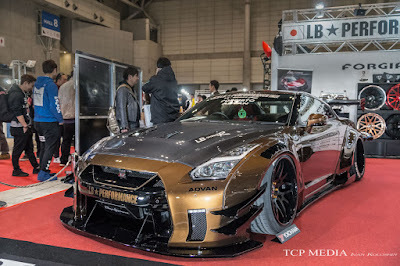 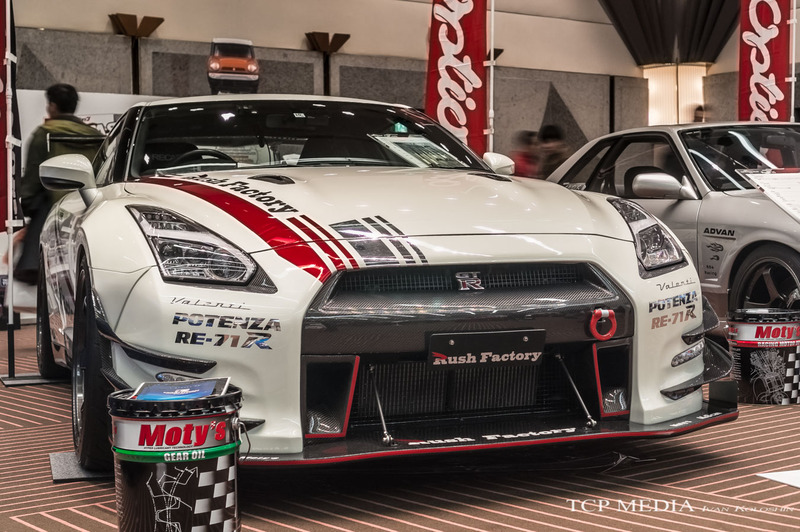 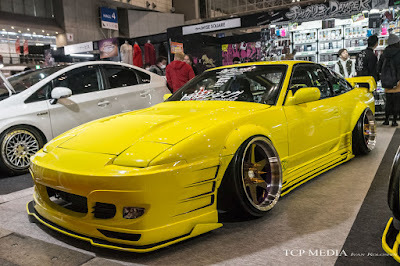 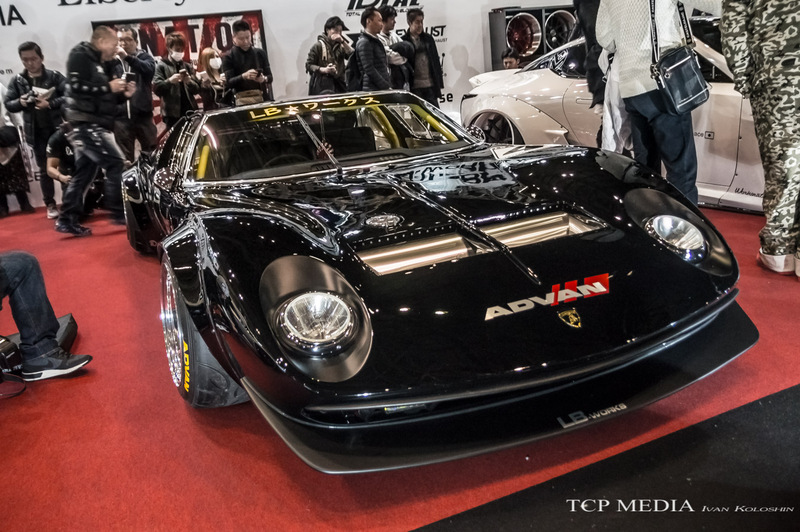 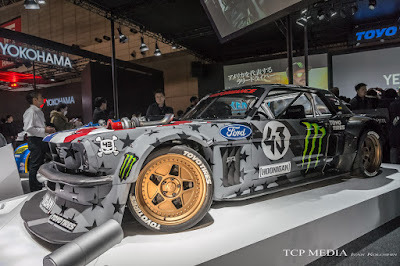 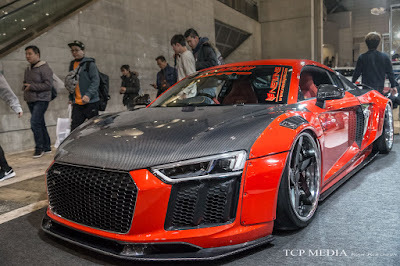 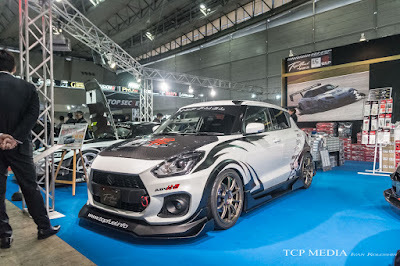 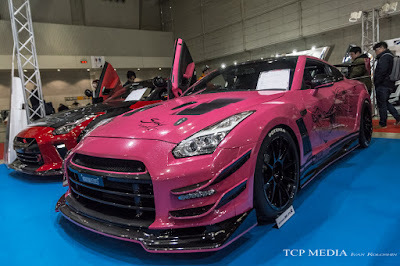 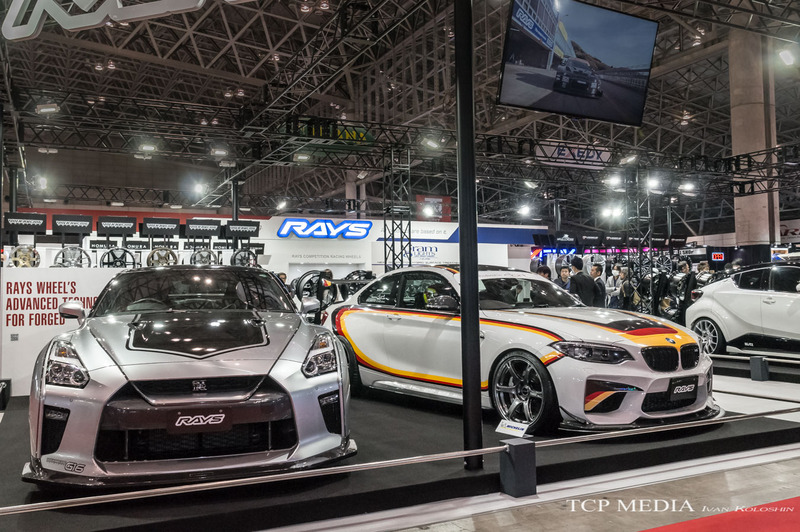 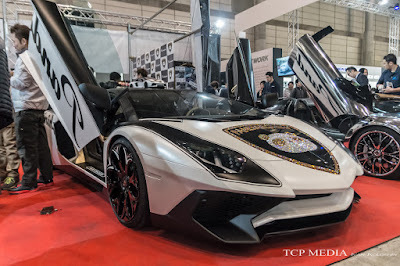 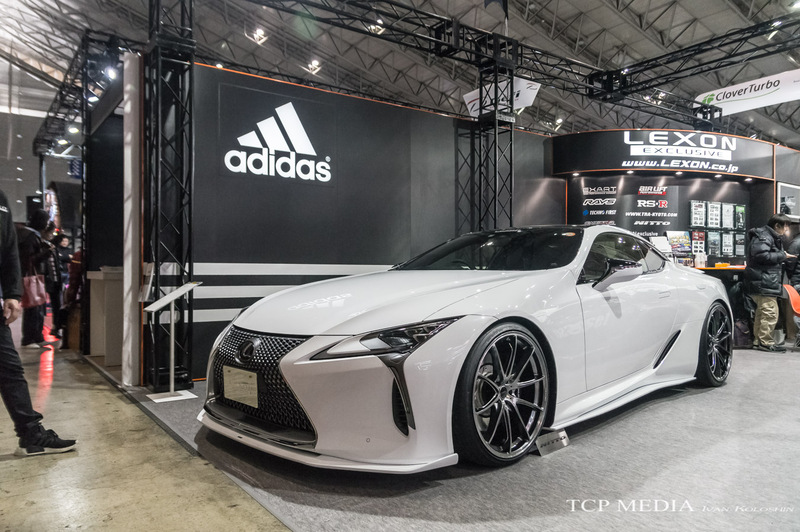 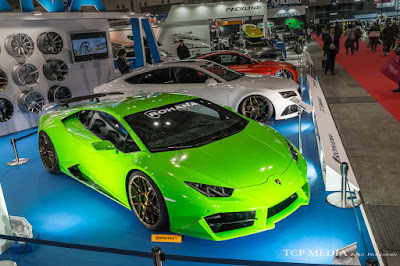 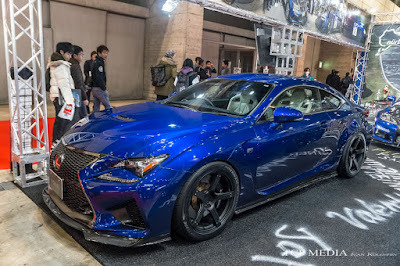 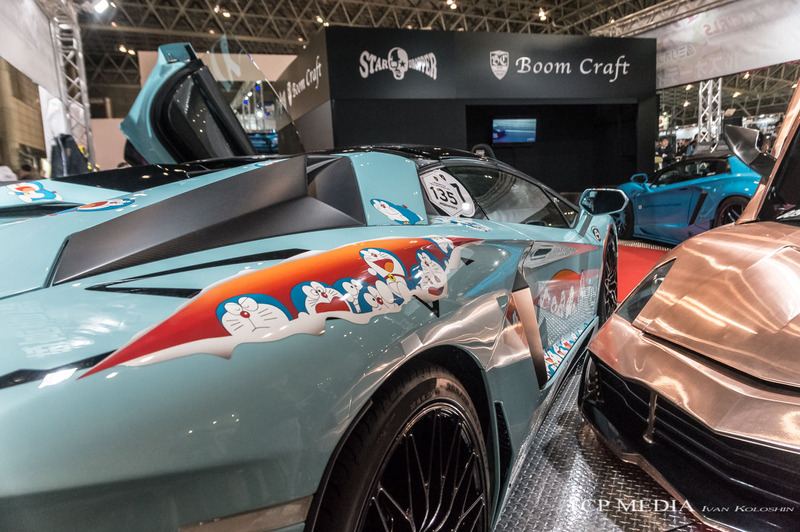 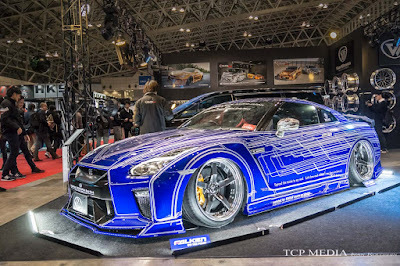 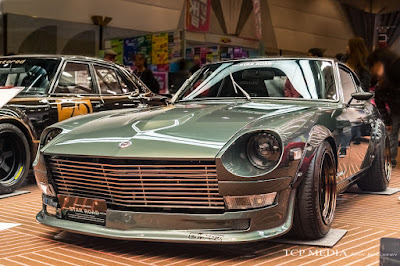 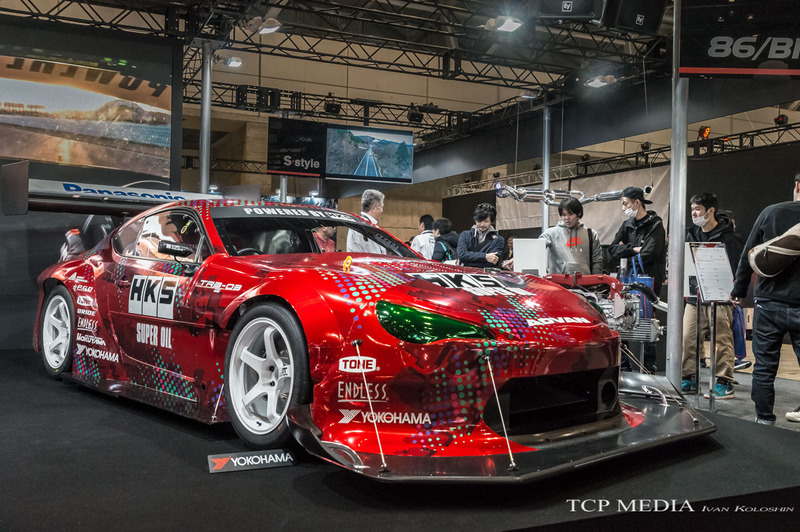 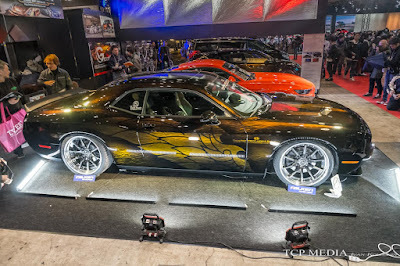 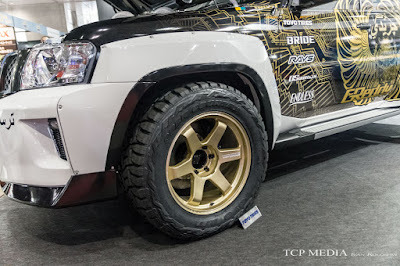 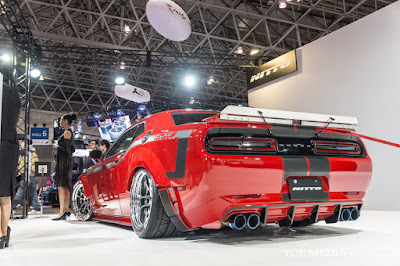 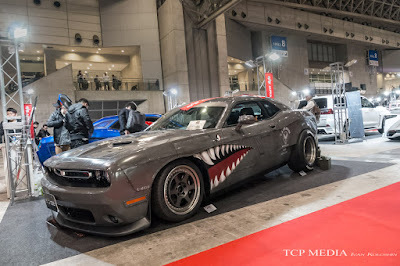 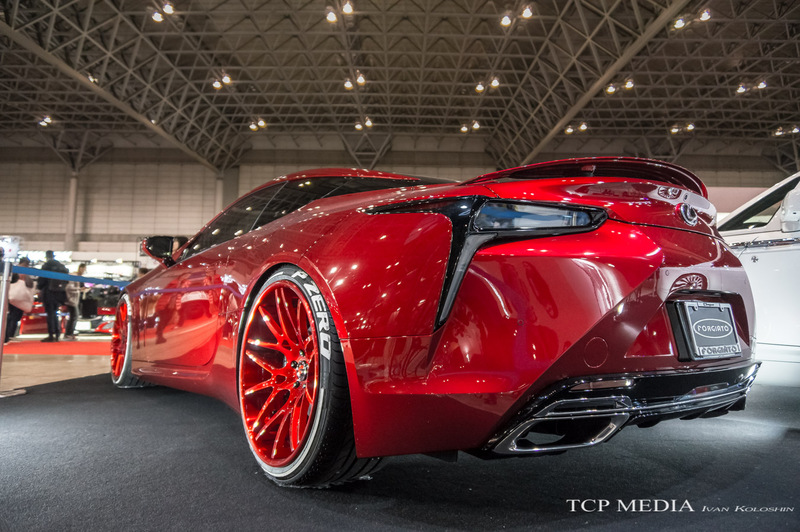 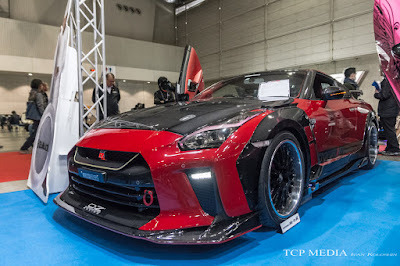 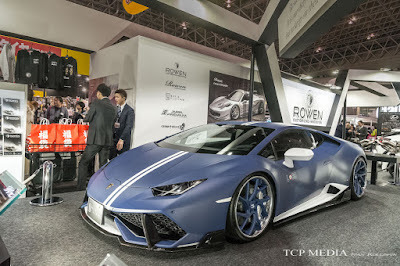 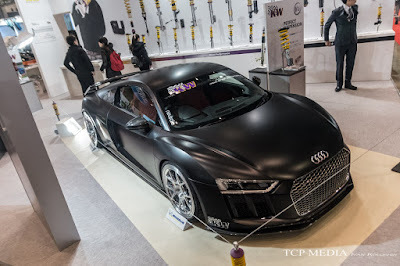 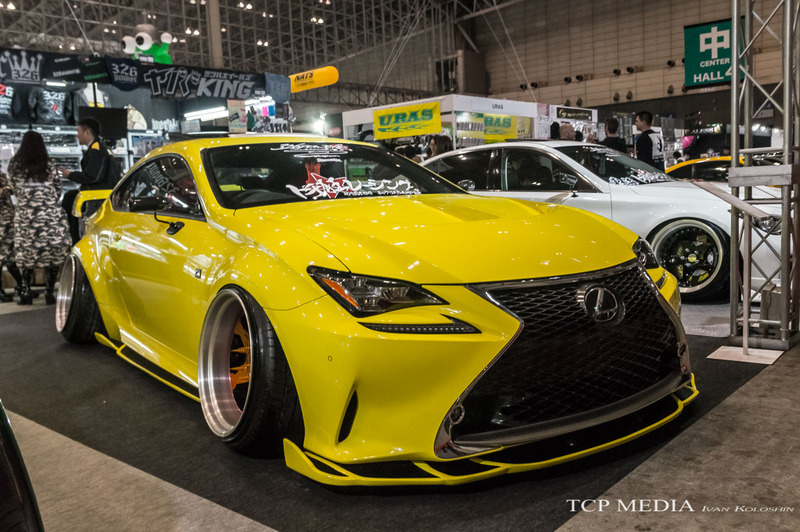 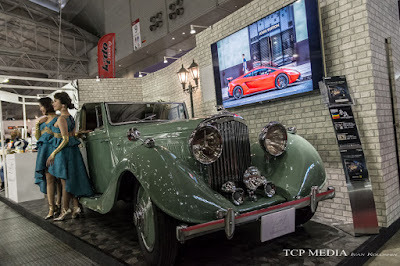 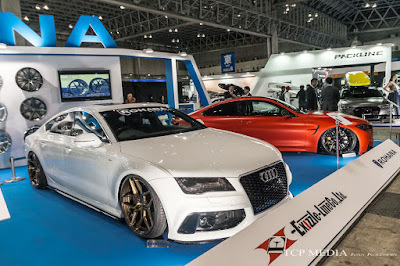 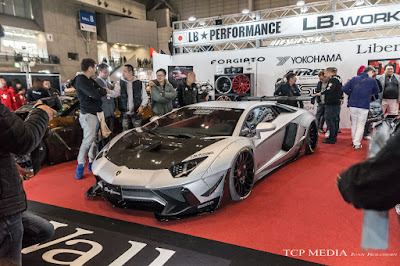 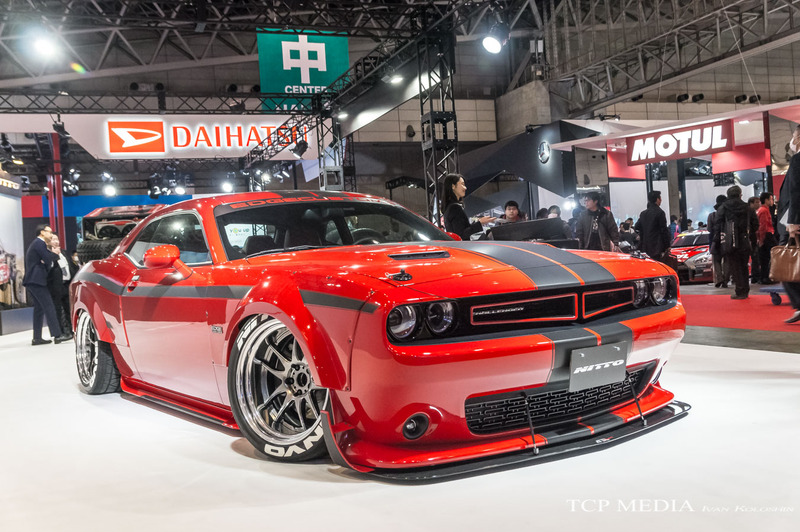 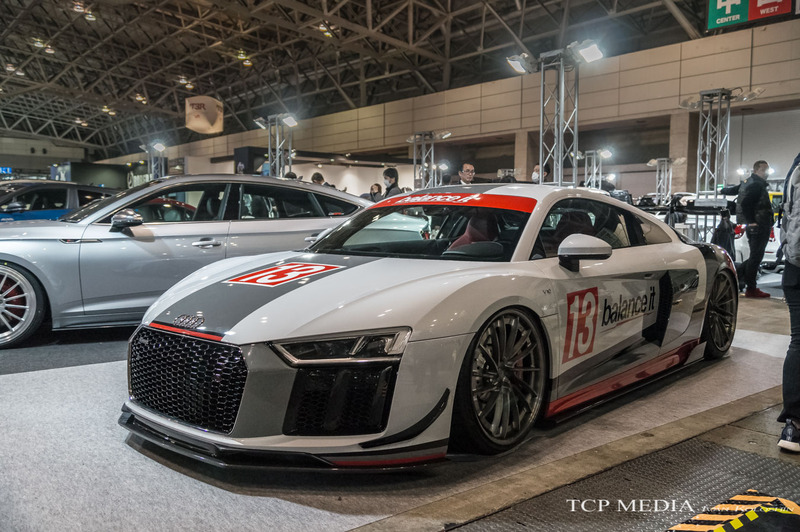 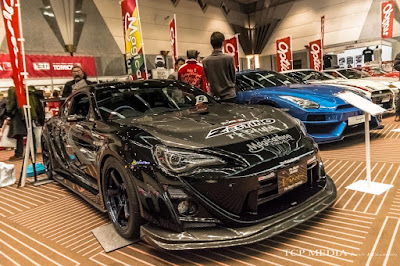 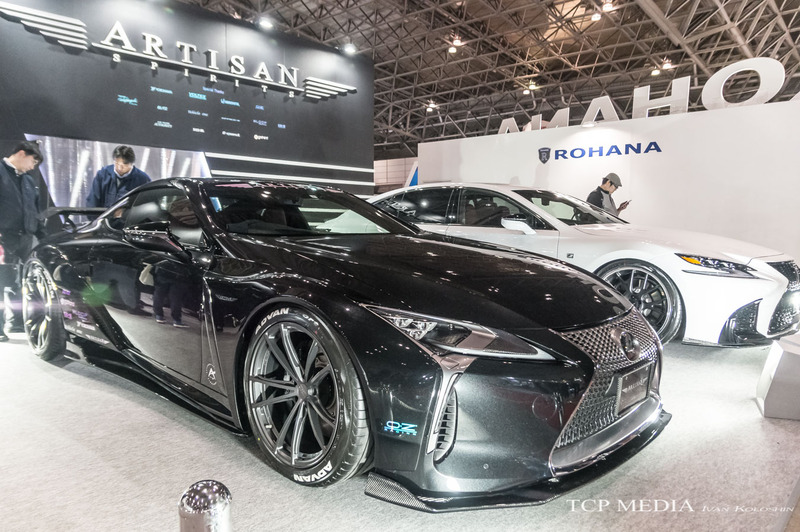 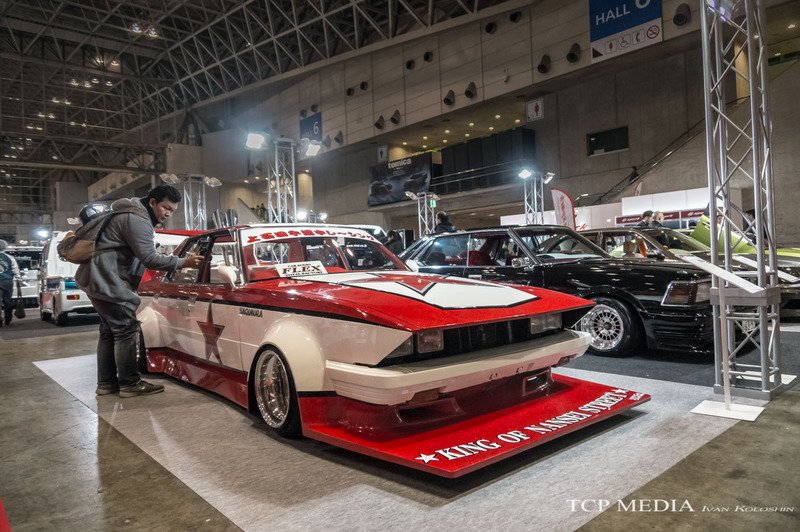 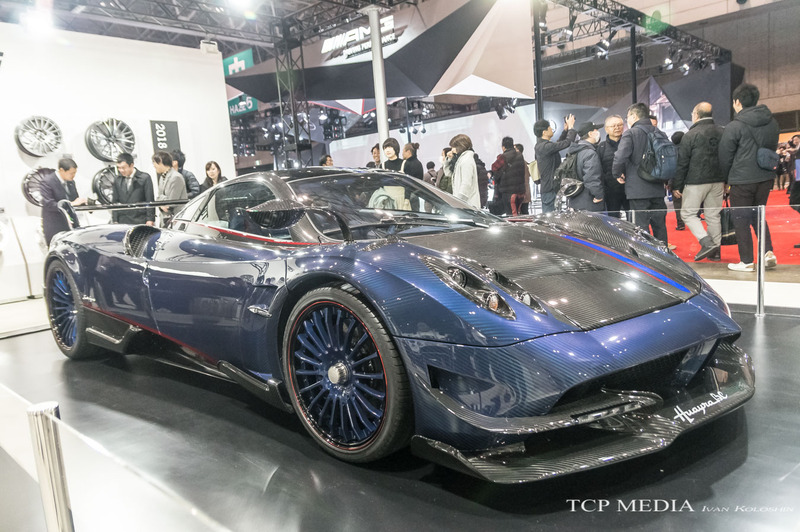 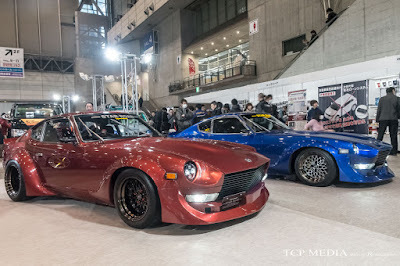 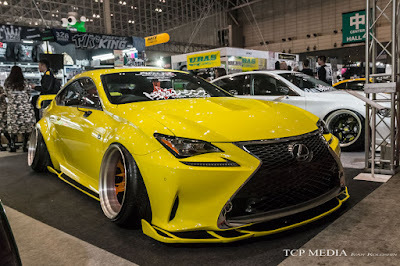 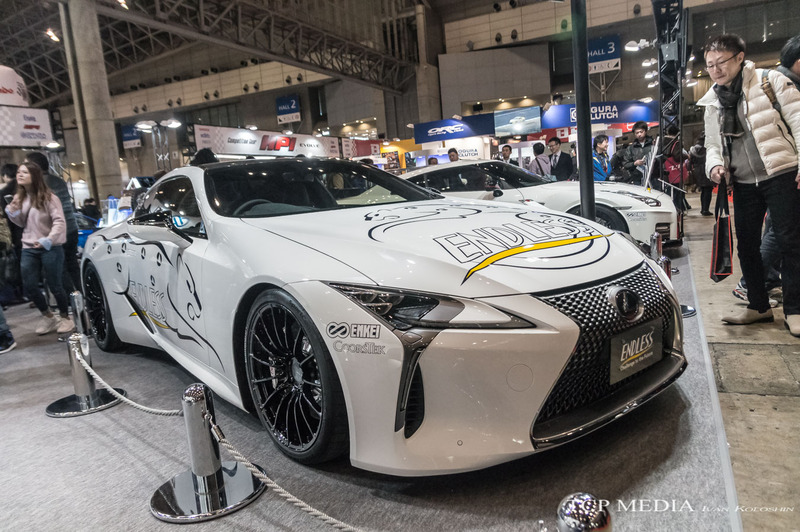 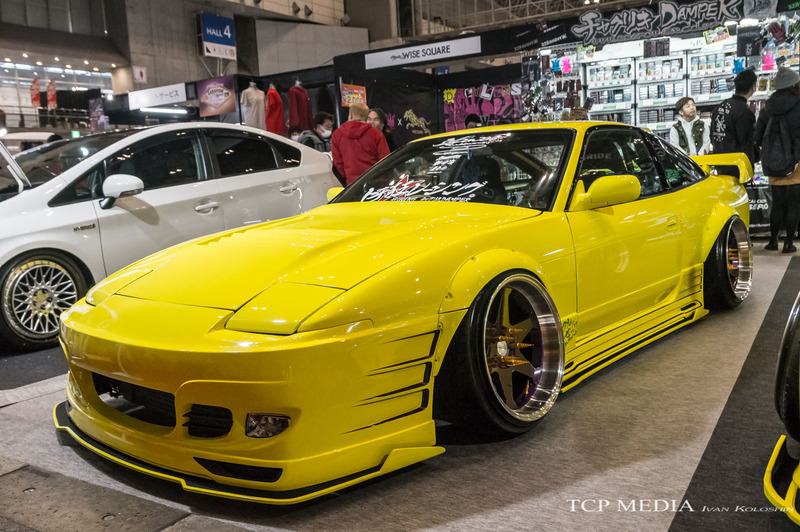 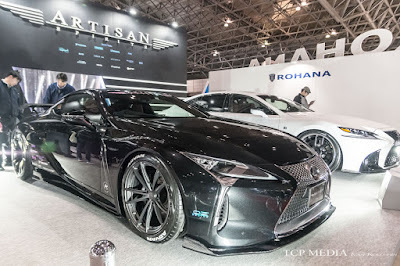 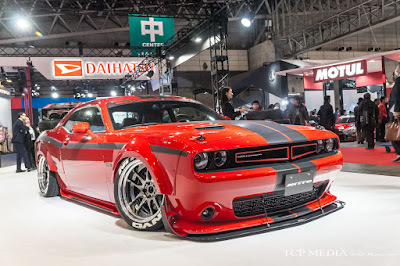 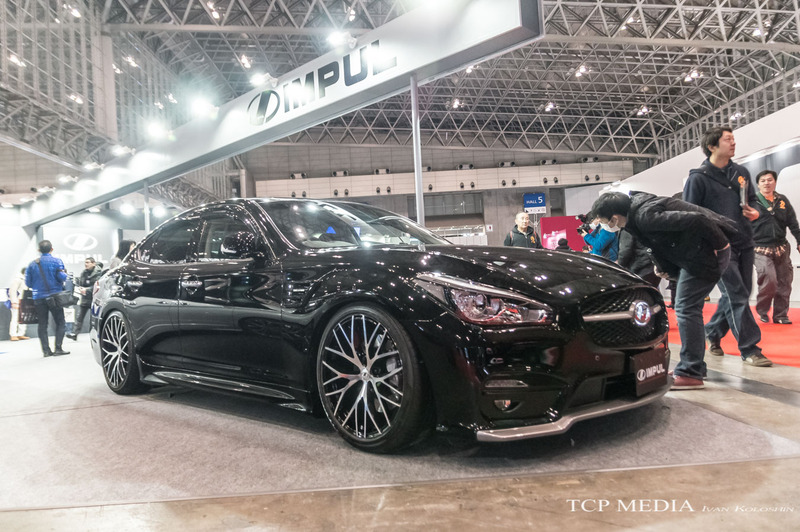 While there was no one car that stole the show, Tokyo Auto Salon took it a step further to identify itself as a culmination of after market scene by placing a strong accent on diversity. 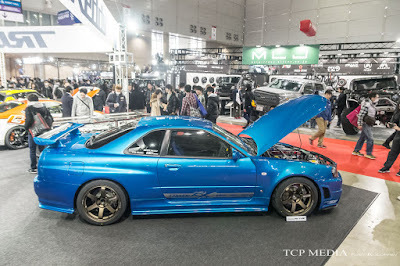 With over 300000 people expecting to visit the task was to give something to every guest, and I think organizers did a fantastic job, while local tuners and manufacturers completely outdid themselves and exceeded all possible expectations. 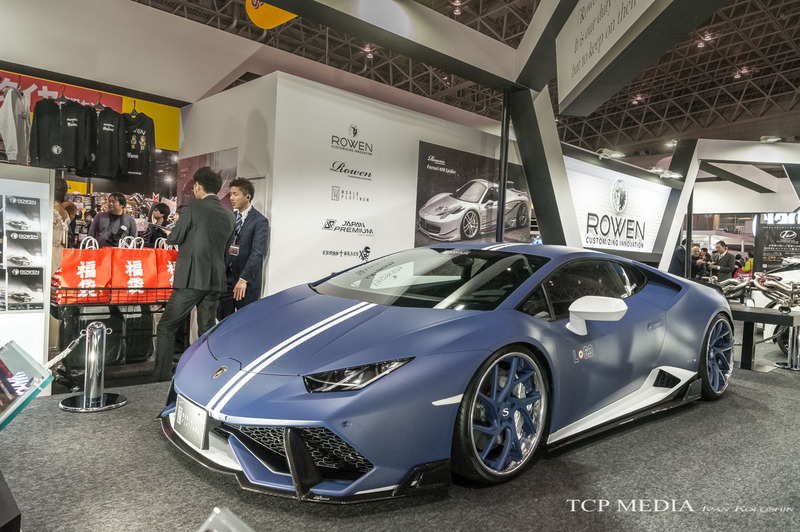 I can also make a statement with utmost confidence that financially Japanese after market segment is doing better than ever. 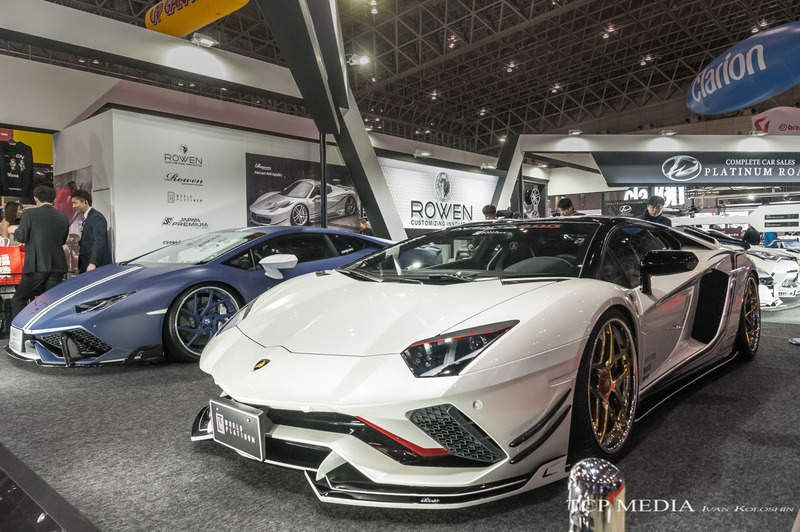 Partially this is due to successful attempts to tap international client base, but also due to the fact that demand is growing locally at unexpectedly high rate. 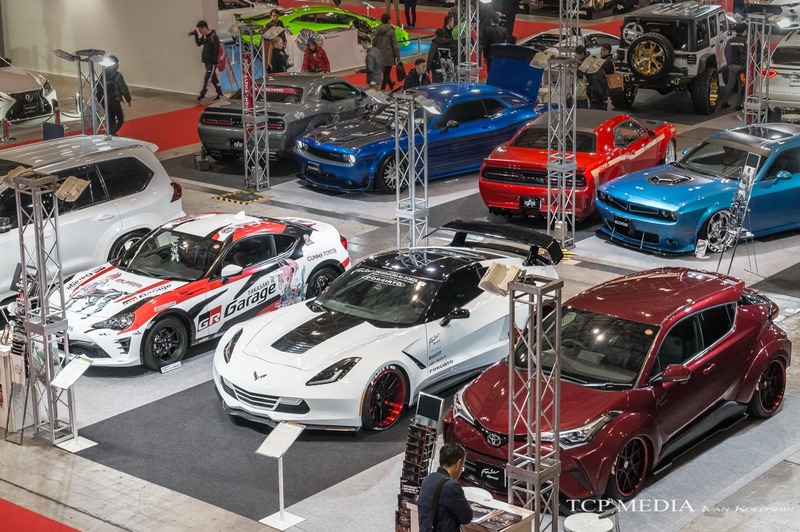 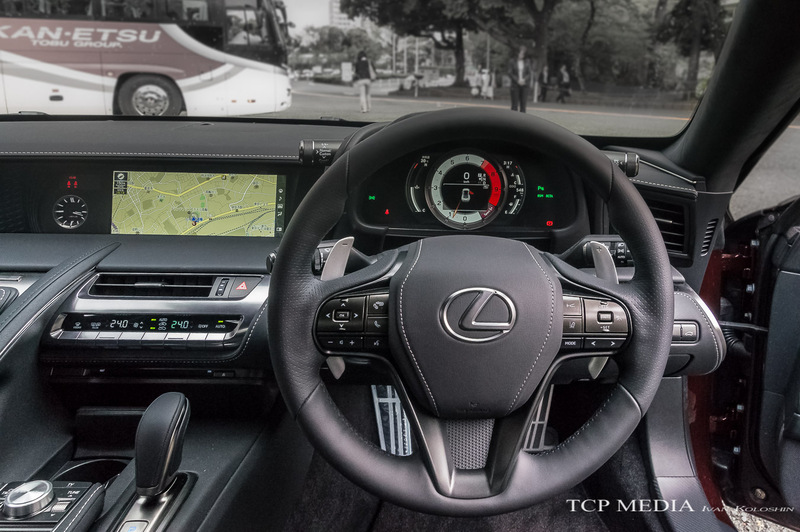 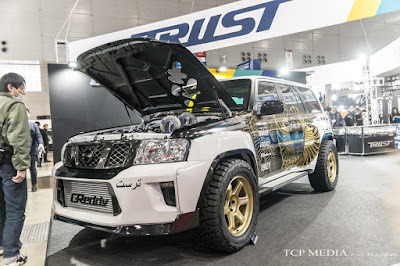 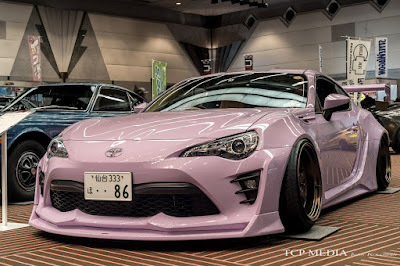 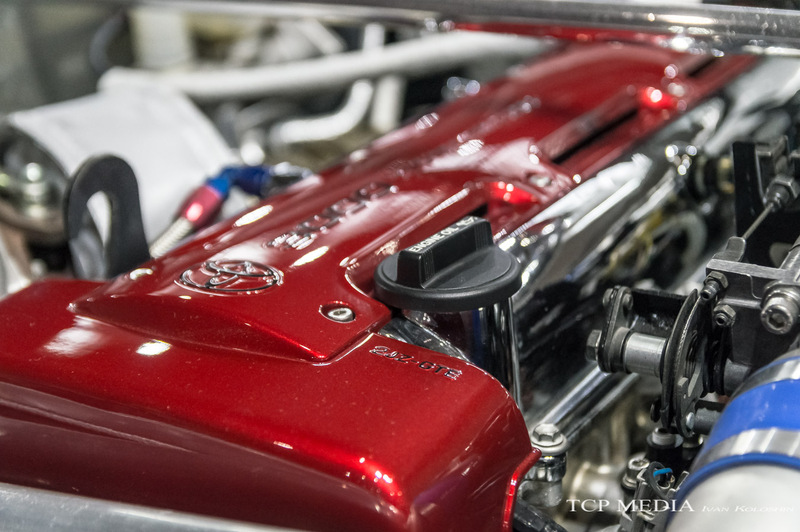 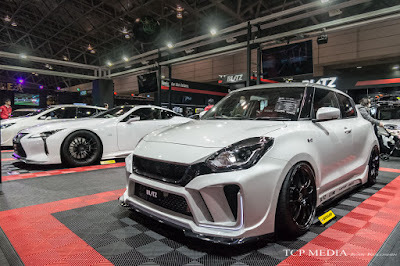 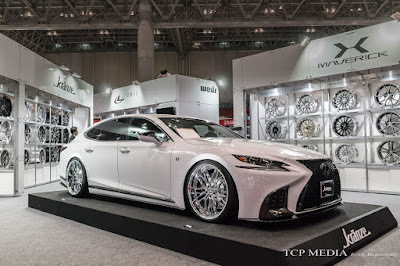 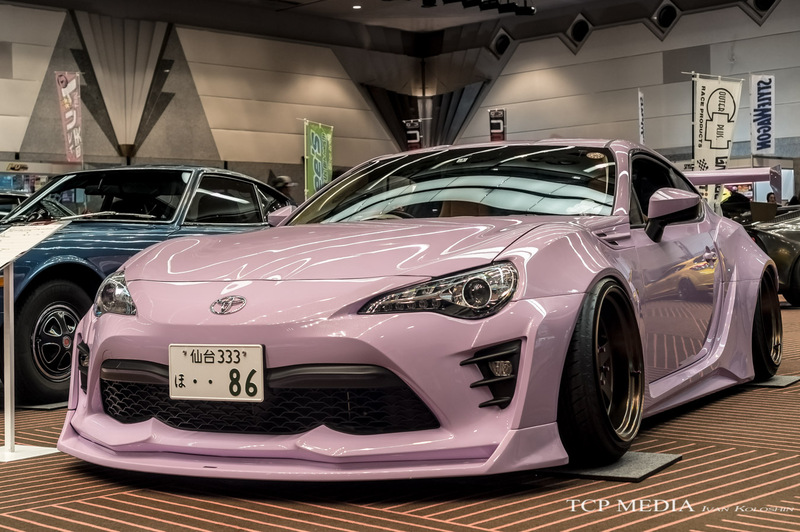 While many sports cars on the streets of Japan have been replaced by minivans, SUV’s and eco boxes, the Japanese have never stopped customizing them, and this brought significant cash flow to the aftermarket parts makers. 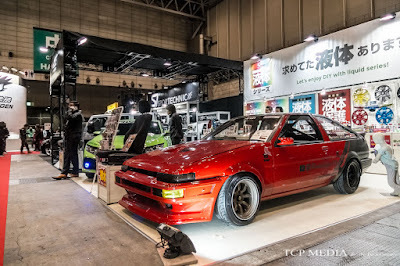 While pumping out led lights or plastic spoilers for Japanese daily drivers they can concentrate their resources on creating some of the most bold and outlandish projects the world has ever seen. 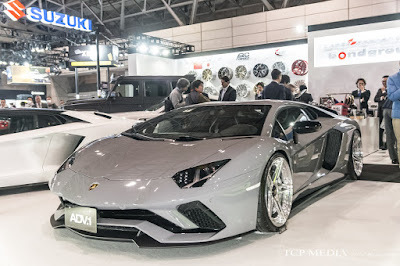 Here we will look at some of the cars that caught our interest during the event. 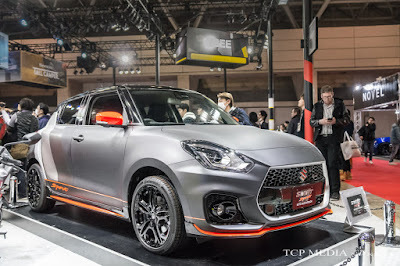 And the Suzuki Swift sport. It doesn’t take a genius to figure out that the cars are targeting completely different market audience. 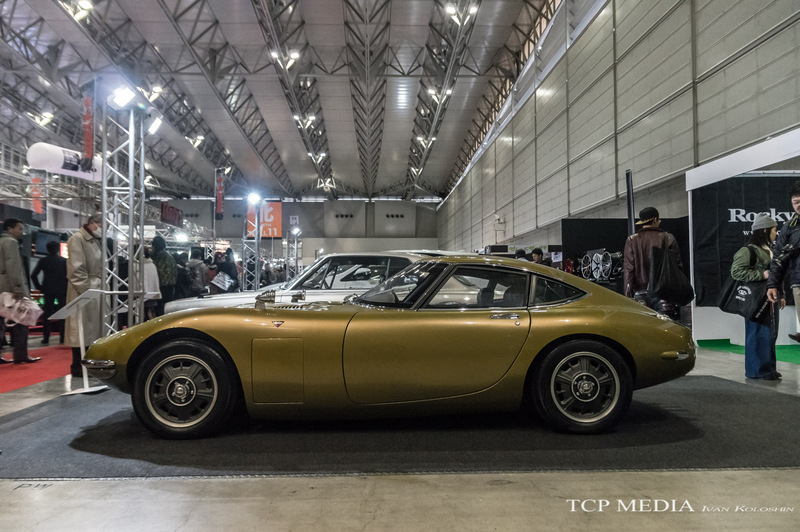 On paper these cars are so different that at this moment you may be questioning my ability to write a car blog, but let me explain. While these cars couldn’t be any more different, after all, they are separated by four cylinders, 330 horse powers a metric ton of weight and a whooping 100000-dollar price gap, they are both equally important to Japanese automotive world. Truth be told, right until actually walking into the hallways of Tokyo Auto Salon, I wasn’t even considering these two cars to be a hot topic, but after spending a couple hours on the floor and seeing virtually every major player present their version of souped up Swift Sport or LC500, it became evidently clear how important these cars are to Japanese aftermarket industry. 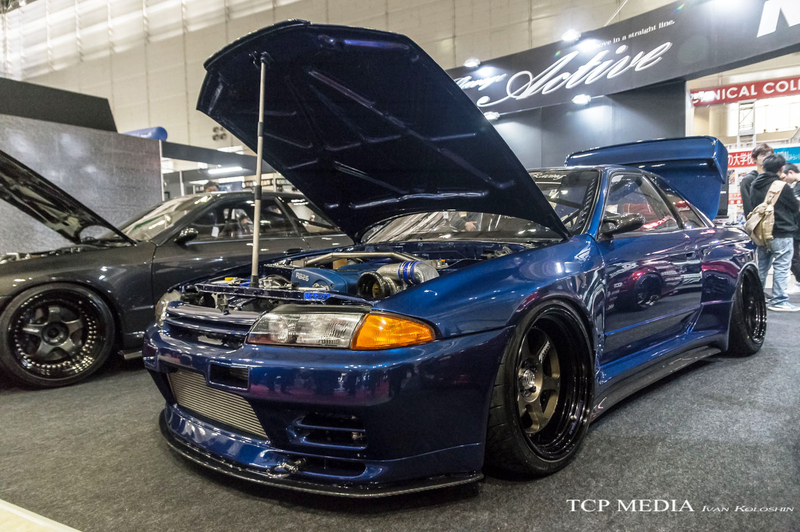 Both cars sold very well and were snatched up by people who genuinely love cars. 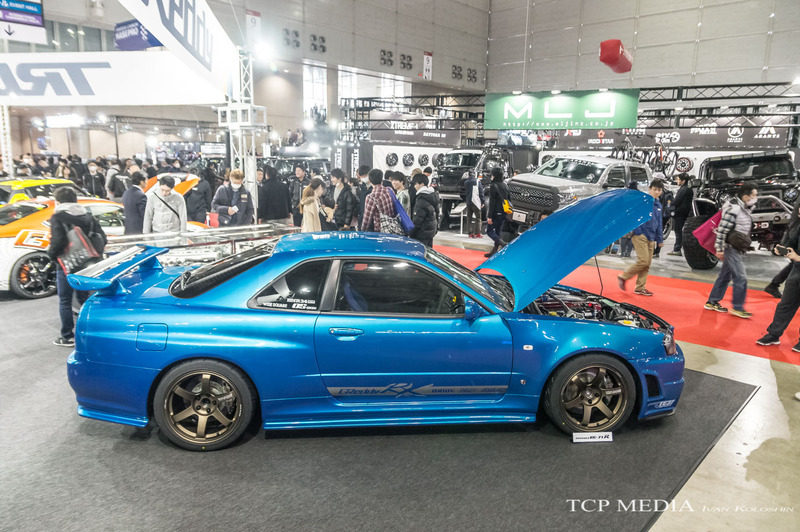 Unlike the golden era of Supra’s RX-7 and Skylines Japanese car fan doesn’t have much of a choice when it comes to domestic models right now, so 2017 put two more options on the shopping list and potential buyers noticed right away, so now let's see what came out of it. Suzuki Swift Sport ZC33S is a Japanese answer to Mini or VW Polo and is now packing a 1.4L turbocharged four-pot and delivering 140HP to front wheels through a snappy 6 speed manual gearbox. It goes without saying that this little compact has the potential for a quick tune as power can be brought to about 200 HP without braking the bank, and with only 970kg curb weight, this has all the potential to be track orientated pocket rocket, as HKS were quick to display. 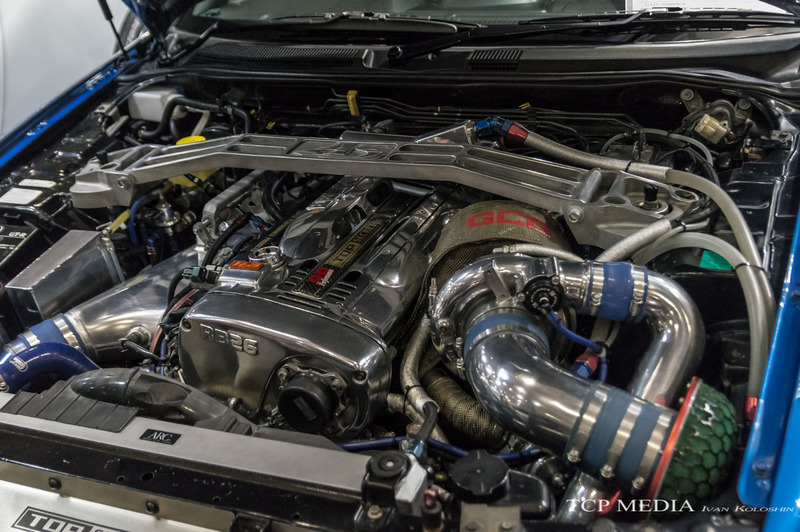 This build from Top Fuel is at the early stage of development and with only small tune-up, some piping and exhaust already produces 165HP. 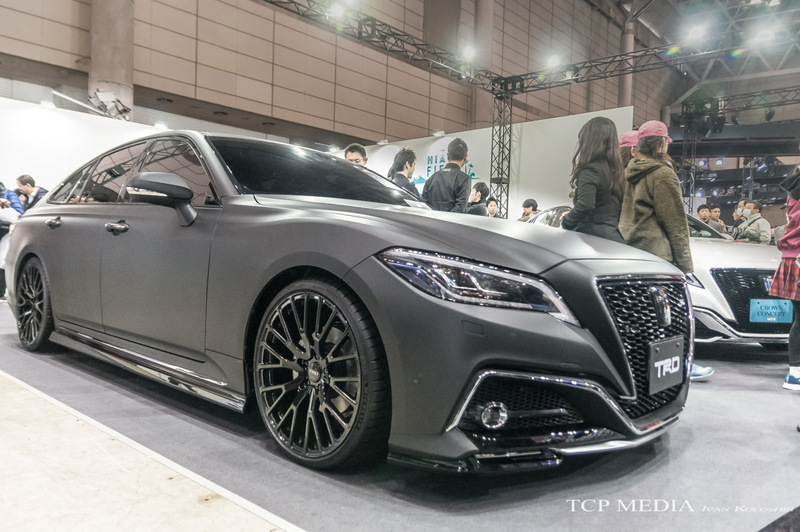 Greddy also presented their version of the ZC33 which has been fitted with full set of aerodynamic parts, exhaust, suspension, blow-off valve , and upgraded turbocharger. This thing must be an absolute blast to drive. 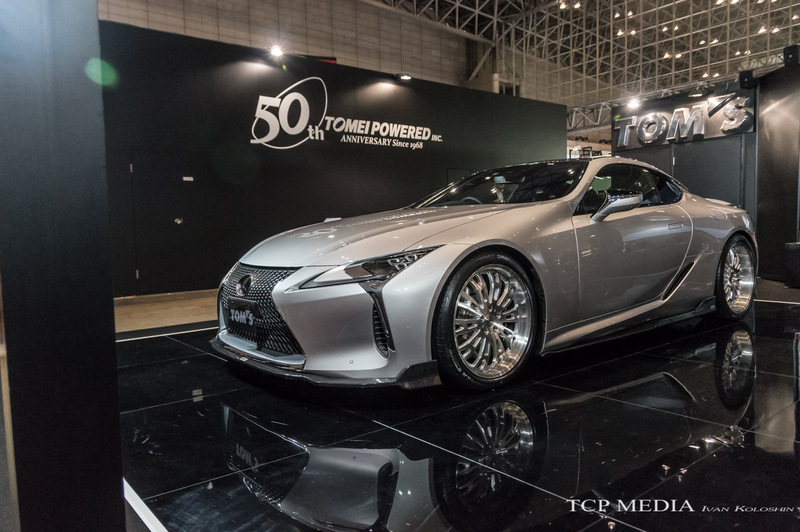 On the other hand LC500 is a Japan's (via America, I admit) answer to BMW 6 series, but with a twist. 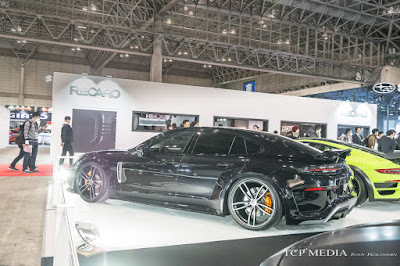 For about same price as much advertised hybrid version you can get a good old fashioned normally aspirated V8 , which we took for a spin last year. 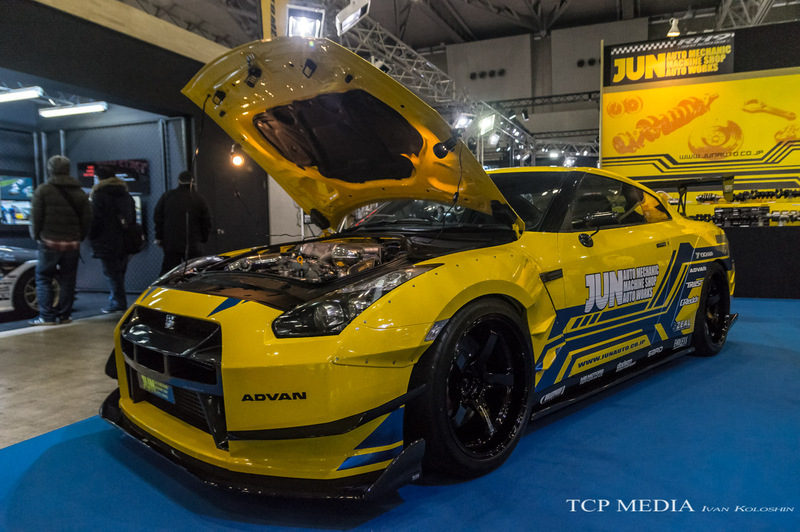 Tuners took a note of that, and so did the customers. 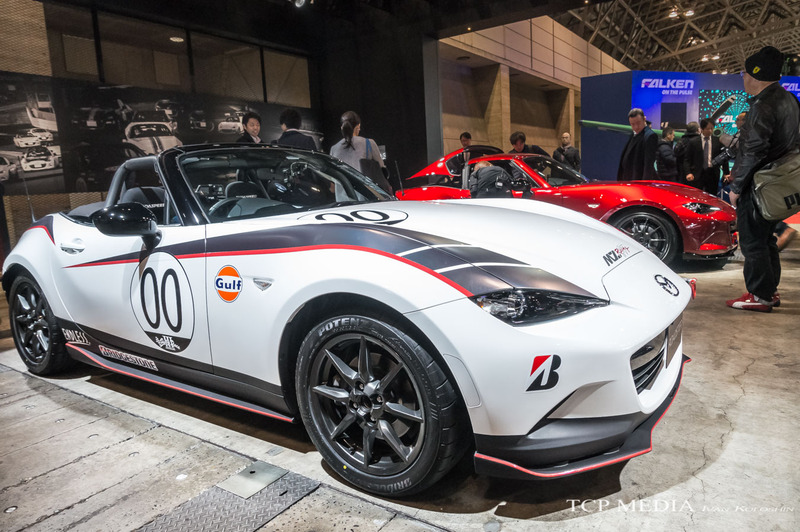 Both hybrid and V8 sold like hotcakes despite a steep 15 million yen price tag, people also went ahead and customized them as if they were Miata's. 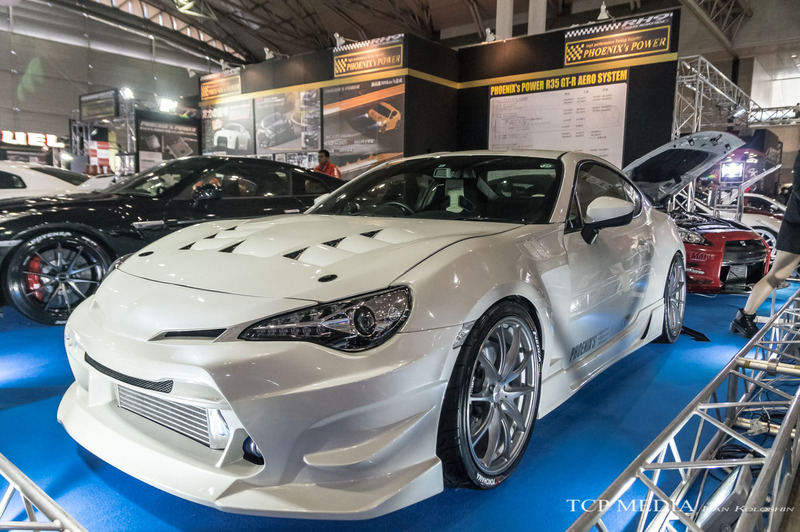 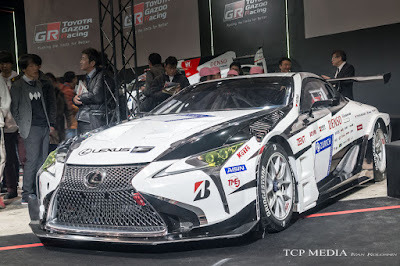 Lexus themselves were happy to make some TRD parts for it and developed a homologized race version of one as well. Unlike the Swift Sport, LC500 comes with plenty of power, so for now engine was mostly left untouched, but aesthetically this car became the love child of body shops as well as wheel brands. 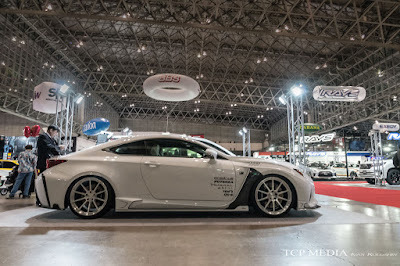 Hence, the new version of Enkei’s RS05RR, now forged and available in 21 inch, specifically for LC500 and new LS. 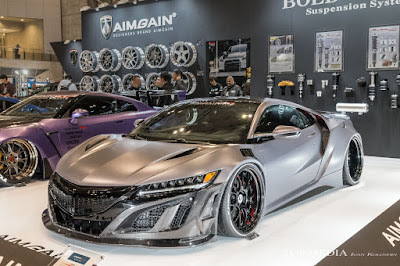 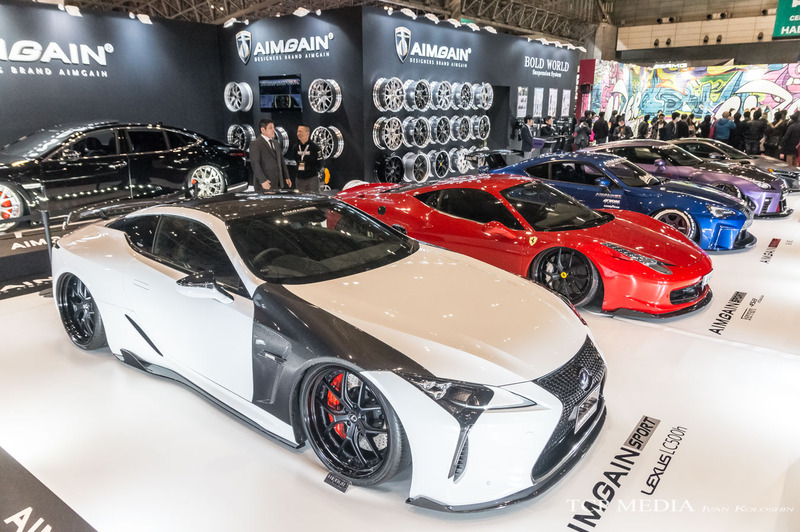 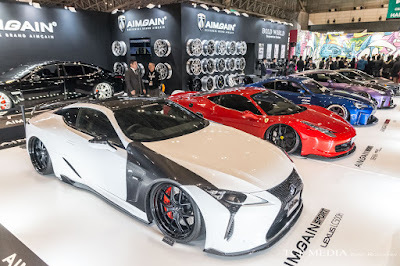 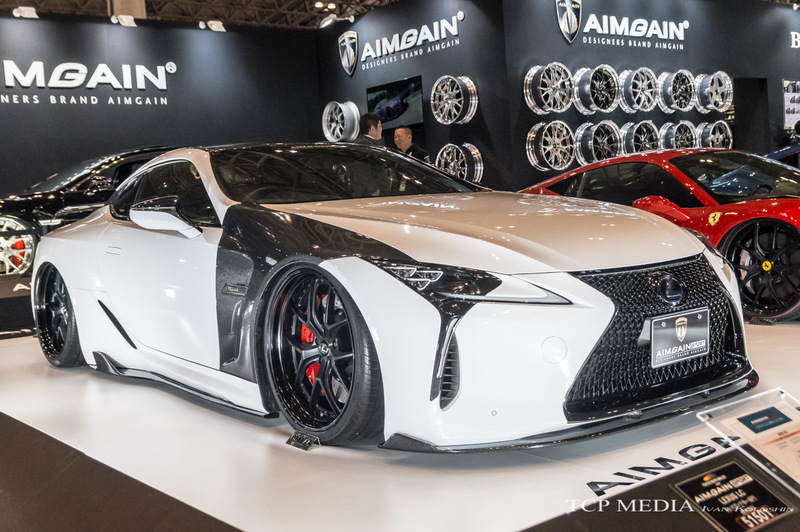 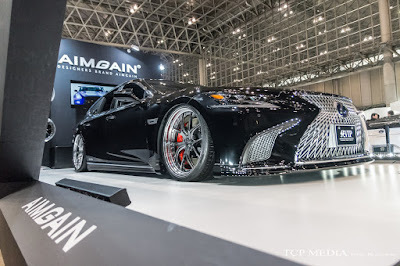 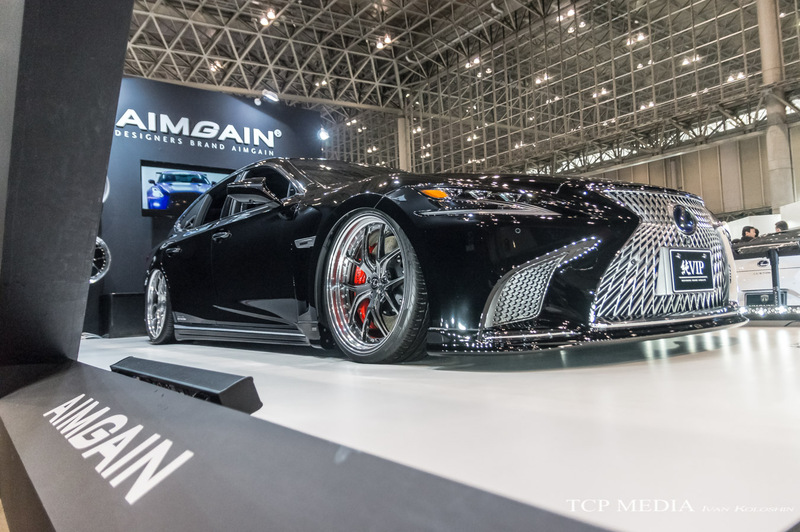 As far as body kits are concerned, AIMGAIN made the impossible possible, and I was completely stunned when I visited their booth. 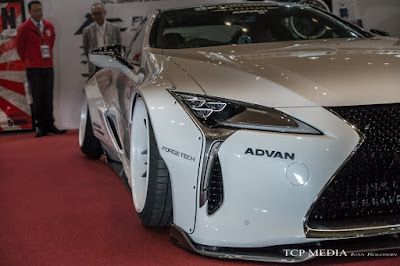 This is exactly how I visualize a perfect LC500. 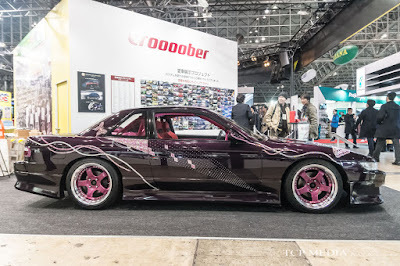 Carbon work is absolutely flawless on those fenders and the car sits low and mean, almost being a rebel in the world of Japanese height regulations and JDM conservative approach to wheel gaps. 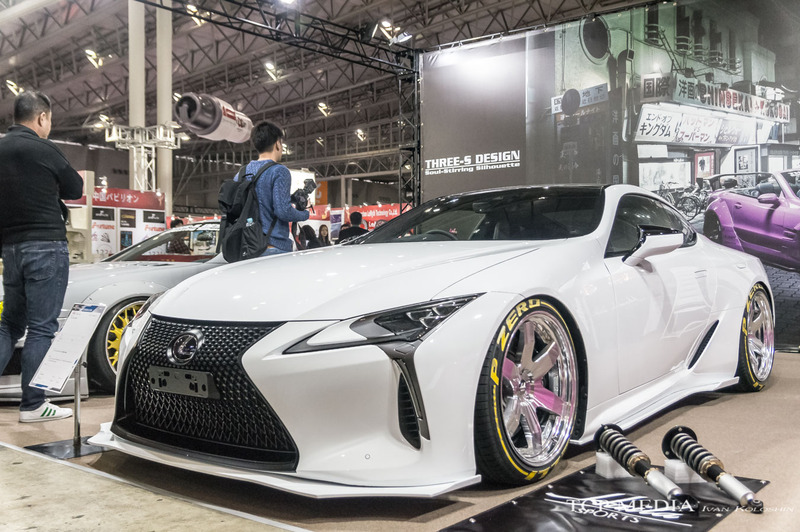 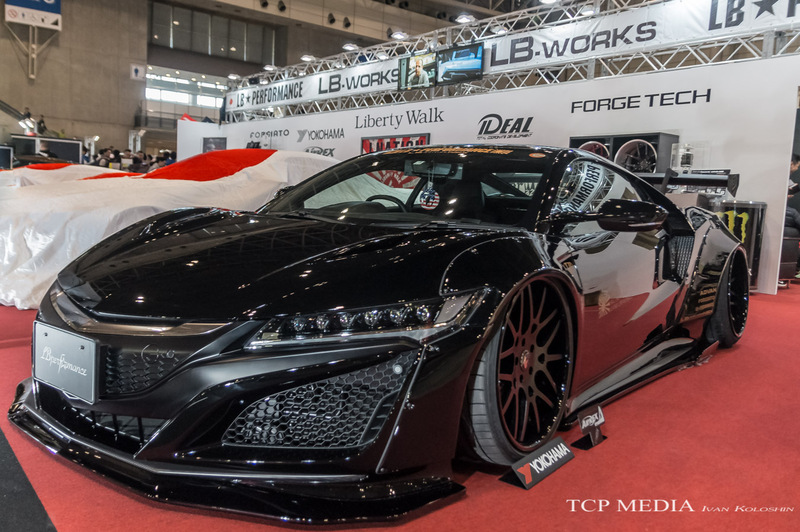 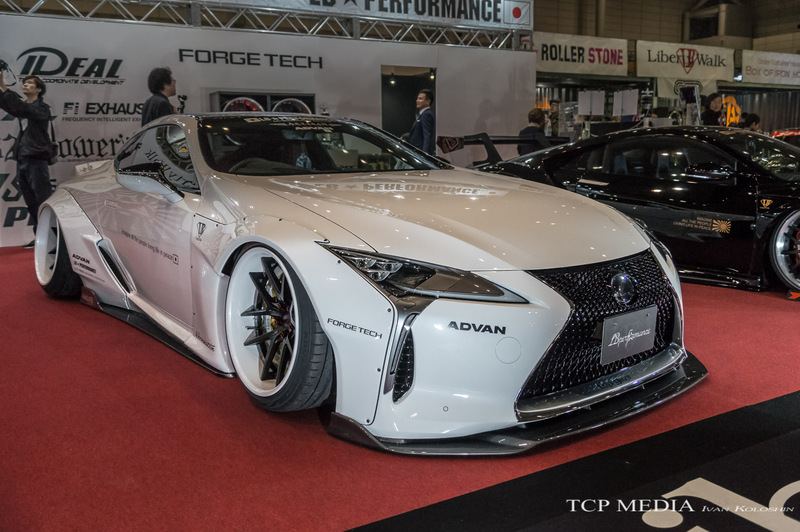 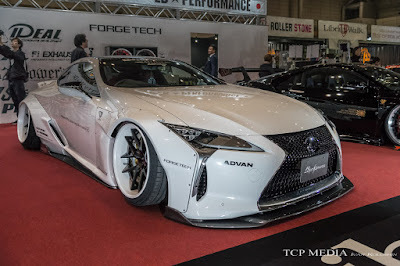 Then this happened, Liberty Walk’s Kato-san is the real rebel and he wasted no time getting his hands on an LC500 and chopping off those fenders in order to install brand new LBWalk body kit for the LC. 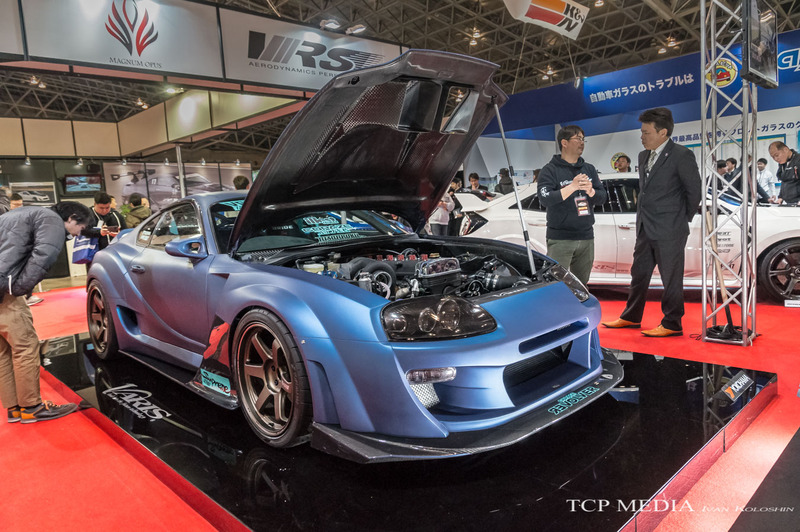 But that wasn’t the only thing he had in store. 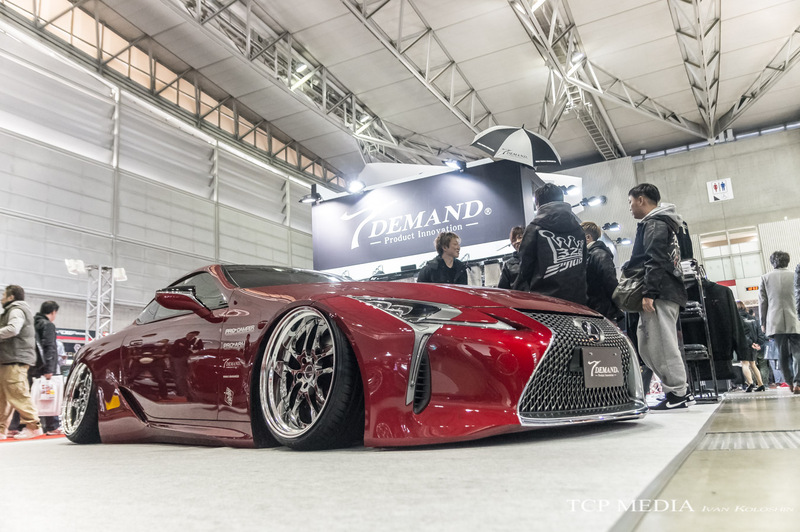 This thing made everyone’s jaw drop. At the same time I heard several people simultaneously whisper “I hope it’s not real” and “I hope this is real”. 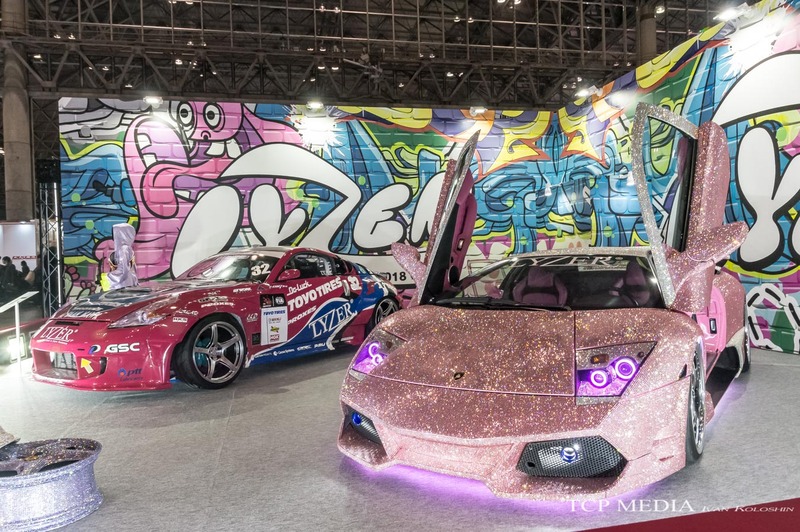 Which side are you on? Well, the truth is that the shell and motor are an old Ford GT40 replica that Kato-san acquired some time ago. 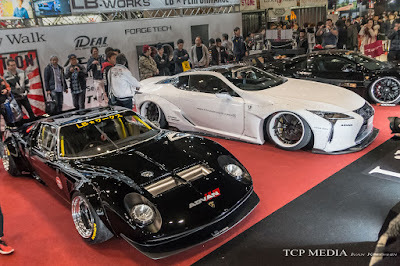 While body was carved from scratch by Liberty Walk to resemble Lamborghini Miura. This is a complete one-off, and with a puny 25 litter tank holding all the fuel for the massive V8 engine, don’t expect this car to accumulate a lot of miles, but it deserves to be in the top 10 exhibits of the JDM WTF museum. One other creation that comes to mind is the Top Secret Smoky Nagata’s V12 Supra which delivered 940 HP and had estimated 420kph top speed. 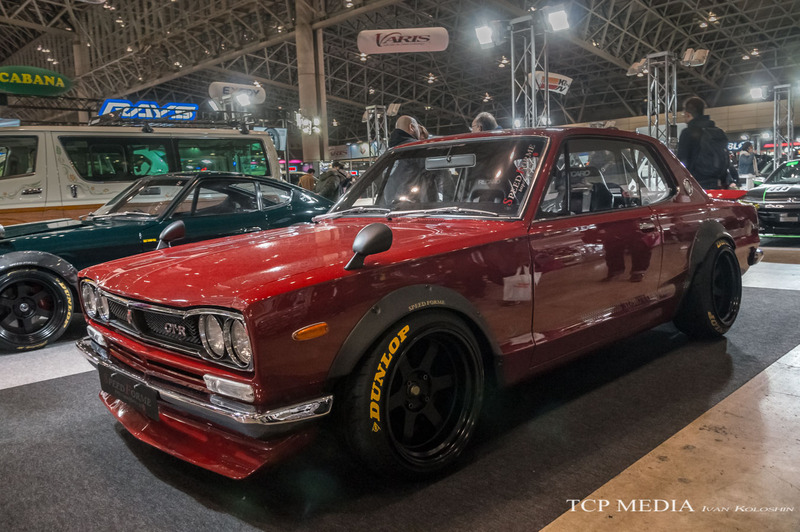 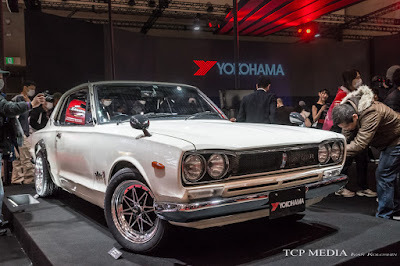 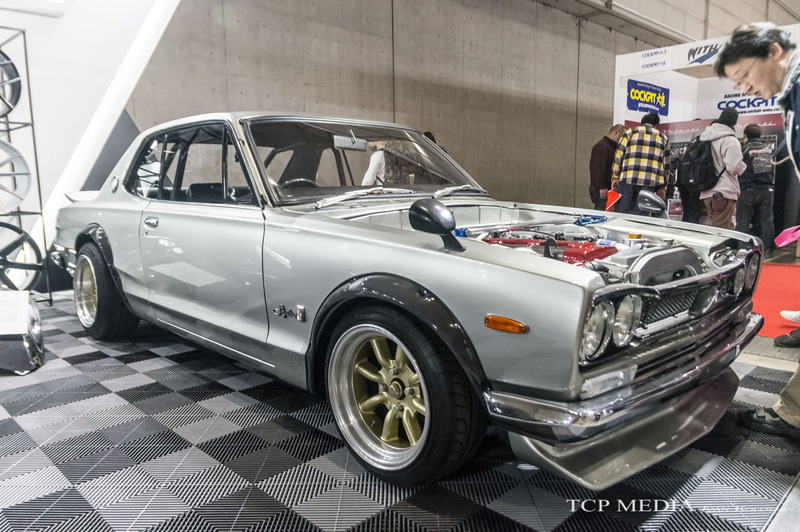 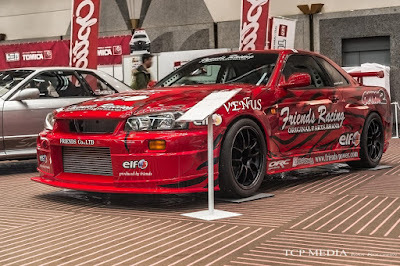 The car was sold at the Japan's inaugural BH Auction held as part of this year's Auto Salon for 9.9 million yen, along with brand new R34 that snatched a whooping 32 million yen, and 2000GT almost 3 times that! 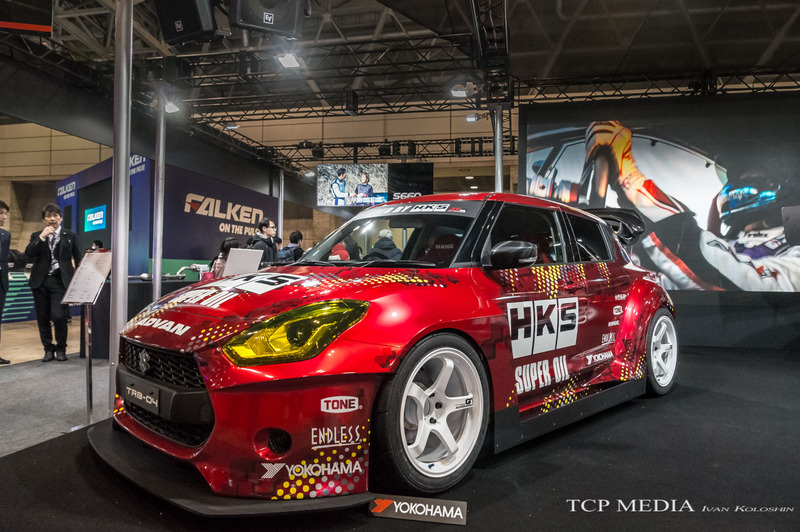 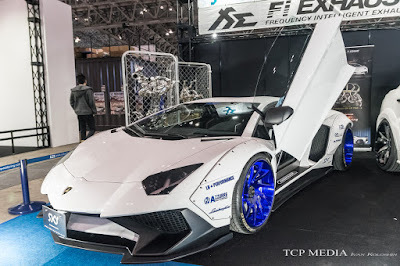 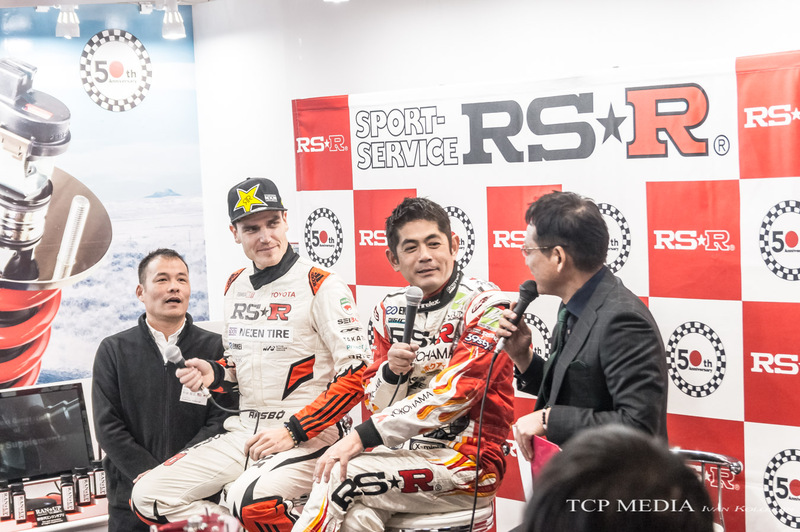 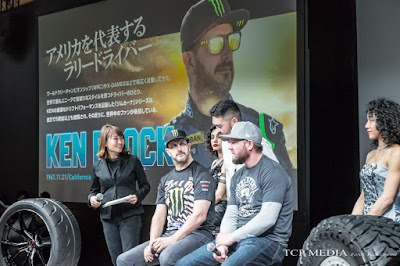 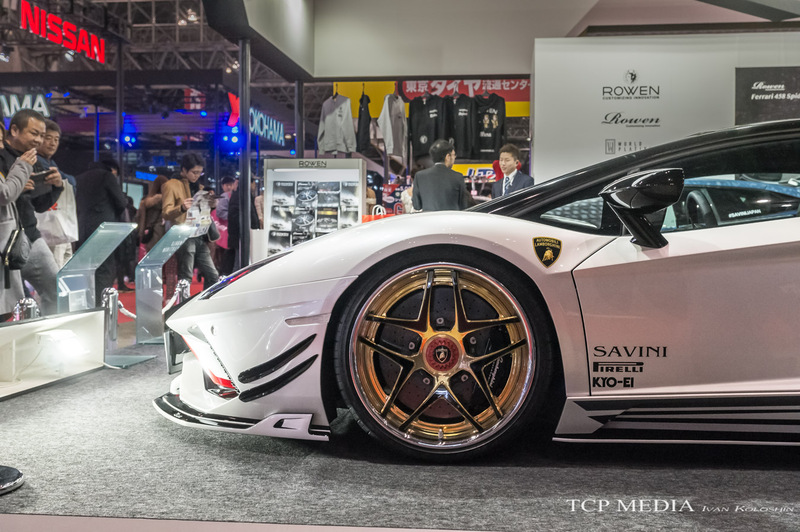 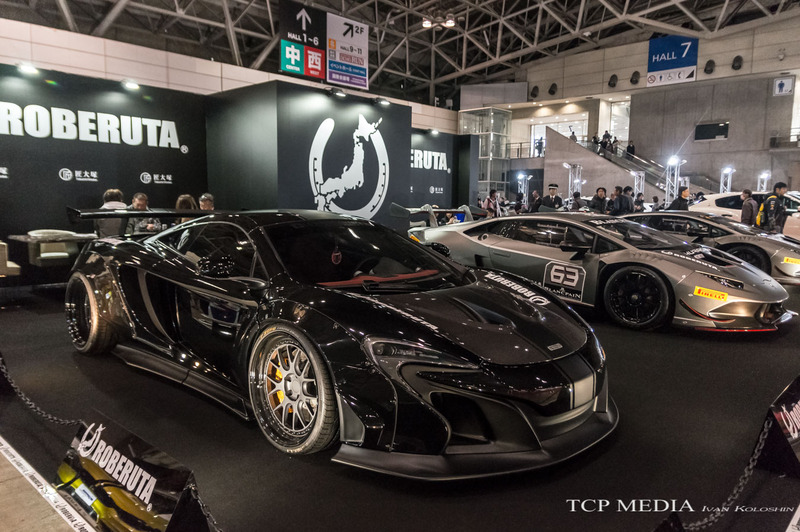 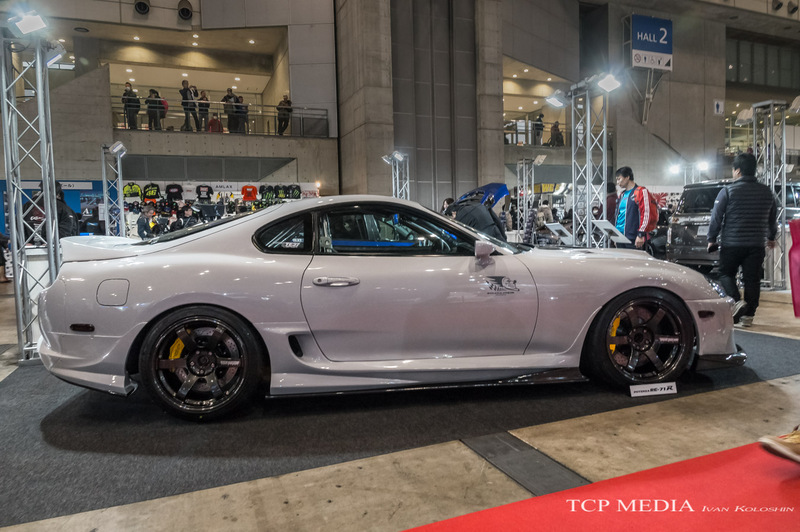 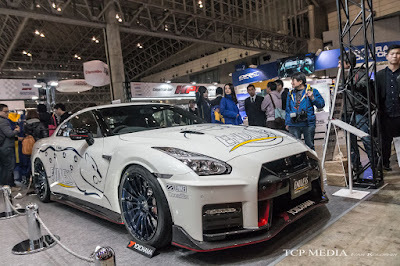 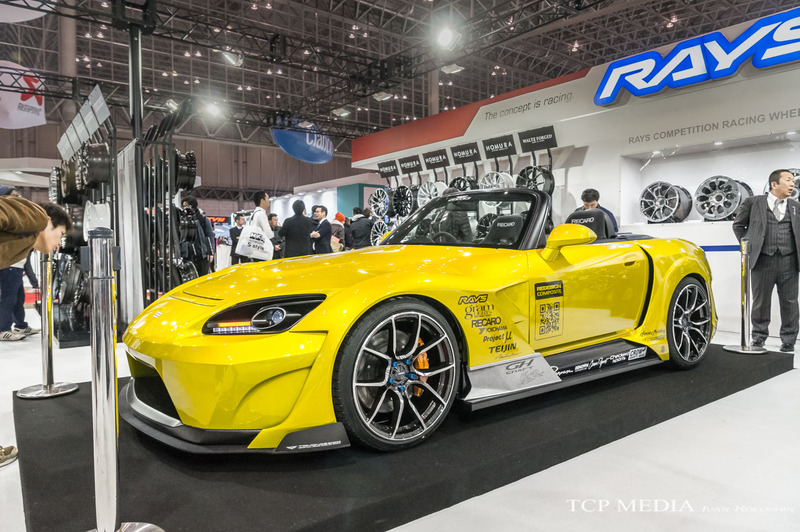 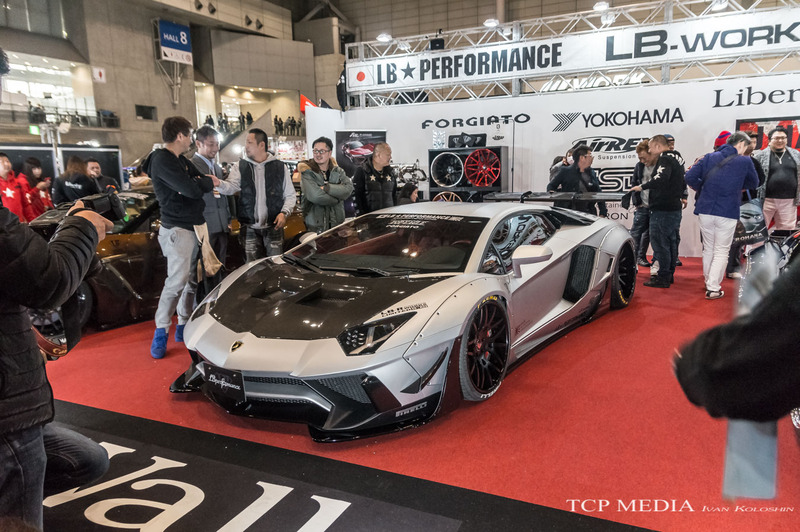 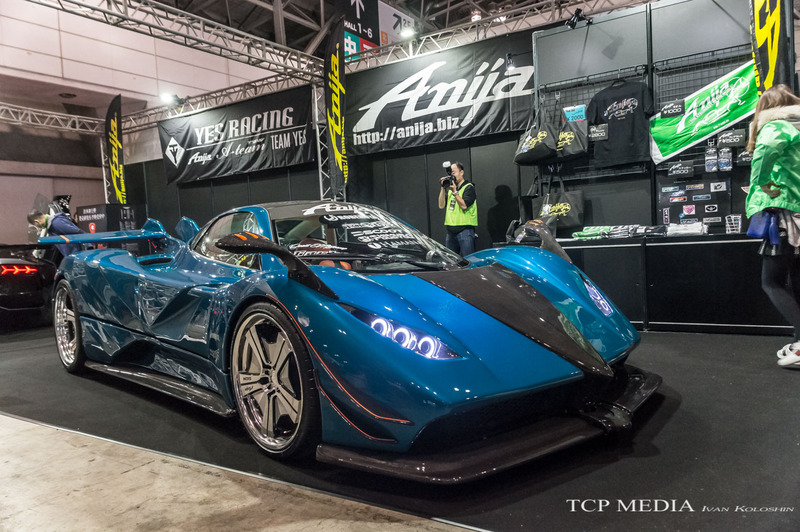 This is the kind of money that changes hand at this event so there is no doubt: Tokyo Auto Salon is a global phenomenon now. 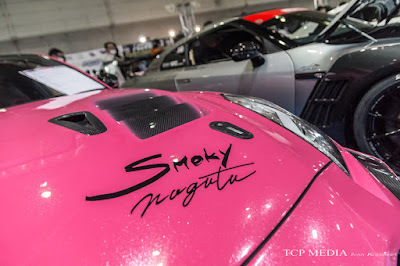 This wasn’t the only Top Secret car to be sold during this event as we are waiving good bye to two custom built Skylines displayed at Top Secret floor space. 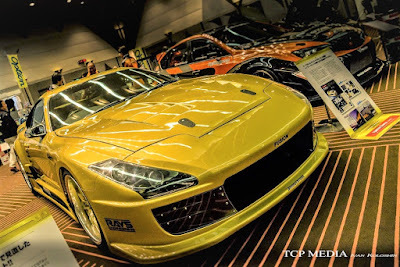 Yes BH auction was only a part of the big deals struck at Auto Salon, there were a few private sales as well. 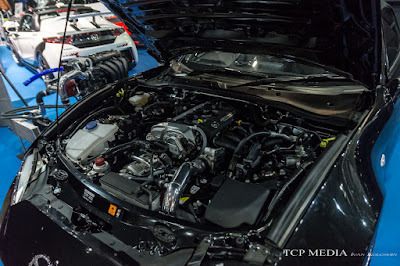 Given that the engine, with the help of BorgWarner single turbo and a whole collection of bespoke upgrades is pushing close to 1000HP, transmission would be the ultimate performance upgrade that allows a lot more of that power to get to the wheels with utmost efficiency. Ken has decided to part with this one-of-kind GTR to concentrate on personal life and perhaps start a new project. 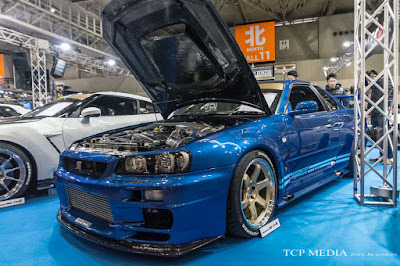 What kind of car would it be, remains to be seen, but for now all I can hope for that even the R34 is sold to customer outside Japan that it would be in good hands and will be looked after. 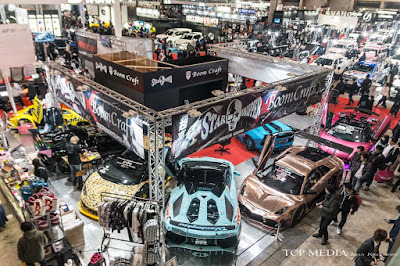 But as as a good saying goes however: show must go on so let's resume right there at Top Secret booth. Smoky is enjoying a huge following and rather wealthy customer base. 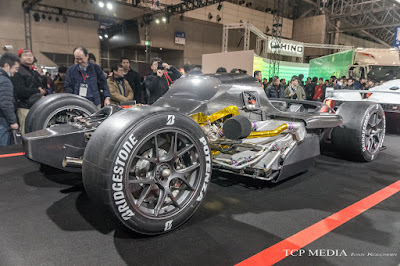 This allowed him to develop new technologies and explore possibilities to push even more power out of his project cars. 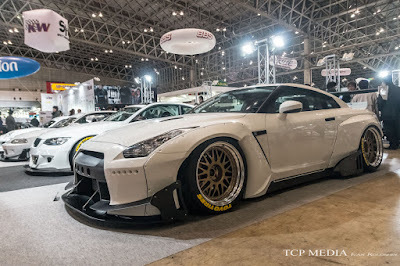 His primary client base are R35’s as he keeps pushing boundaries of laws of physics to make these beasts even faster. Some Top Secret project cars are more famous than others, such is this beast that belongs to one of Japan's celebrity chefs, and his recipe for GTR's is as spicy as his noodle bowl. 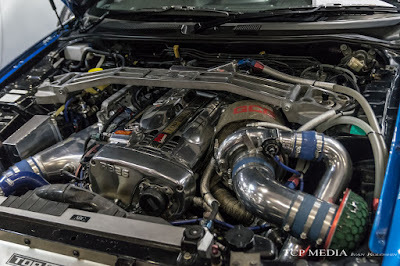 Producing 750 horse power with a help of G'reddy TD6 turbo and Process R engine management chip this an example of how powerful these machines can get with just simple changes in configuration. Personally, In think this is also one of the best looking GTR's as Smoky has retrofired MY17 body kit with carbon bonnet and lip spoiler. The owner has also chosen striking OZ racing Botticelli-3 wheels to match. 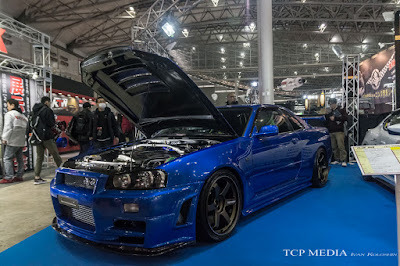 but it wouldn't be Tokyo Auto Salon without significant presence of earlier models, such as this R34 from G'reddy booth in custom shade of Bay-side blue. 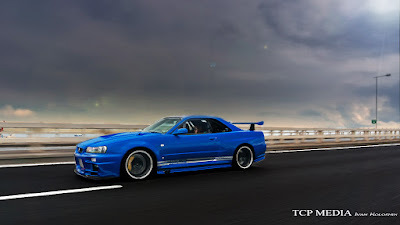 With this car G'reddy is announcing a complete refresh of R34 and general RB26 DETT product lineup. 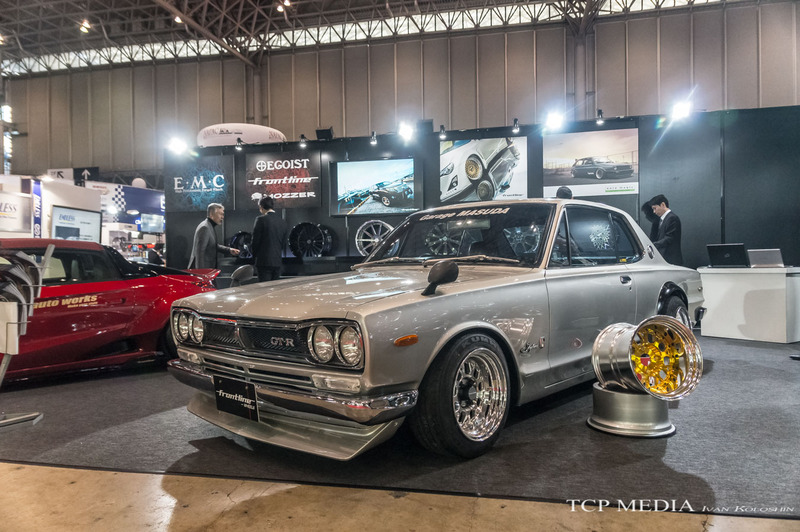 Should be an interesting year for Skyline owners. What really blew my mind was this pair of R32 Skylines GTR from Garage Active. 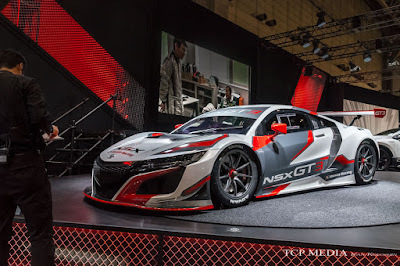 While all the expected engine components such as 2.7L stroker kit and HKS GT3-5R turbocharger are there, and spiced up with NX NOS and OS88 Sequential gearbox pushing 900HP to the wheels , engine was only a part of the equation. 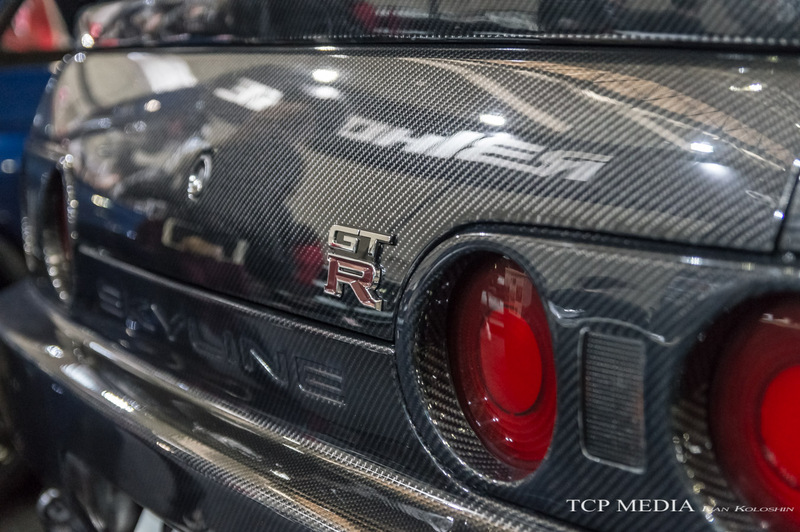 but it turns out entire body was re-manufactured in carbon fiber, perhaps taking a page out of Overtake R35's book, but engineered to perfection with all panels fitting perfectly and fished in wet carbon for that glossy almost factory look. Absolutely amazing work! Yes guys from the Cartist Chiba went to the extreme and managed to fit a Supra engine into 60's Skyline, perhaps because they can! 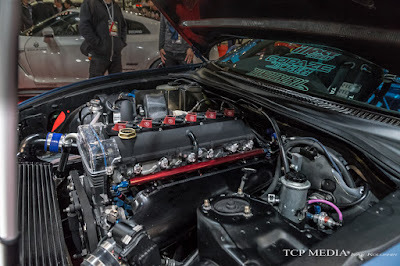 And while we couldn't have a peak at the engine bay of this latest Rocky Auto creation the subble logo is rather self explanatory. I hope we'll see this car again at Nostalgic 2 Days to take a closer look. 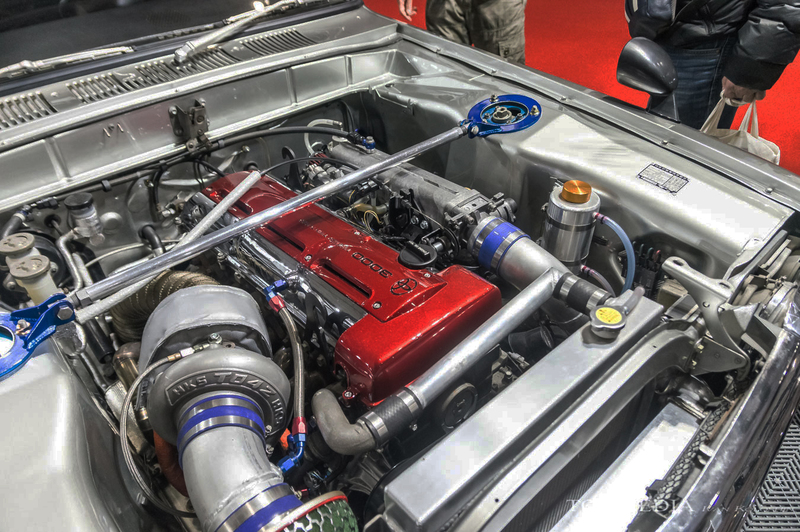 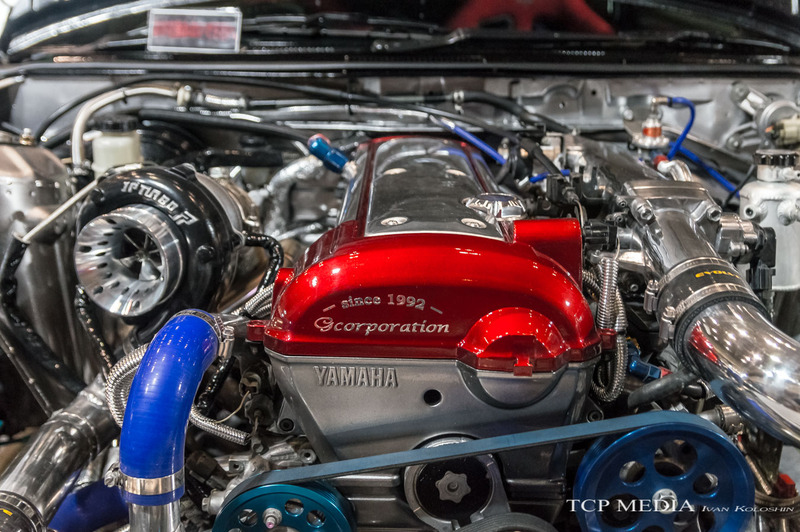 In this example is a smaller 1JZ engine, but the amount of work that went into it more than makes up for lack of displacement. 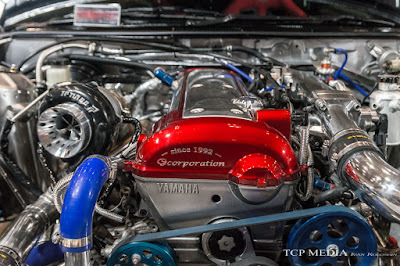 Sporting a Yamaha logo, perhaps indicating who really was behind engineering of these engines it packs about 550 horses thanks to Delta & JP Turbo B640X kit, SARD fuel delivery system, and custom Flash exhaust. 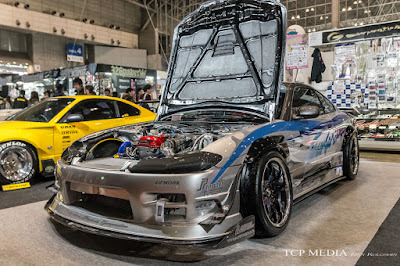 This time the motor was thrown into an S15 Silvia by G-сorporation make perhaps the ultimate drift weapon. 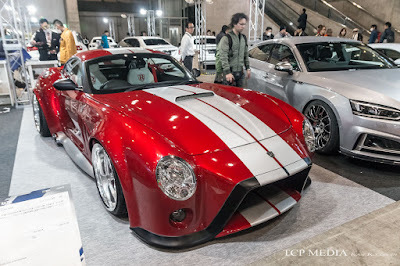 But let's not forget where Toyota's Straight-six as most at home: the JZA80 as reminded here by this beauty owned by none other than Max Orido -proclaimed Japanese GT500 and drift pilot. 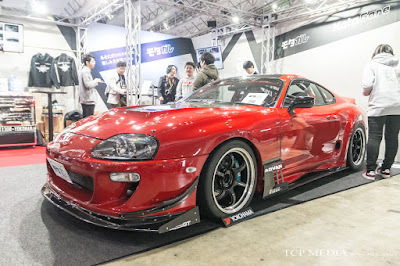 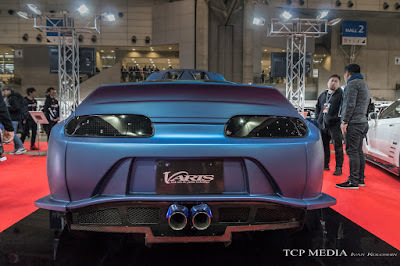 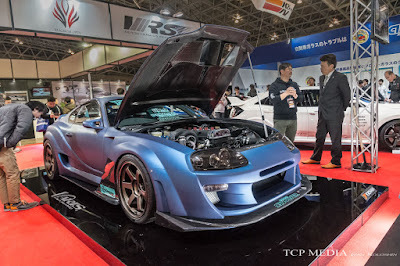 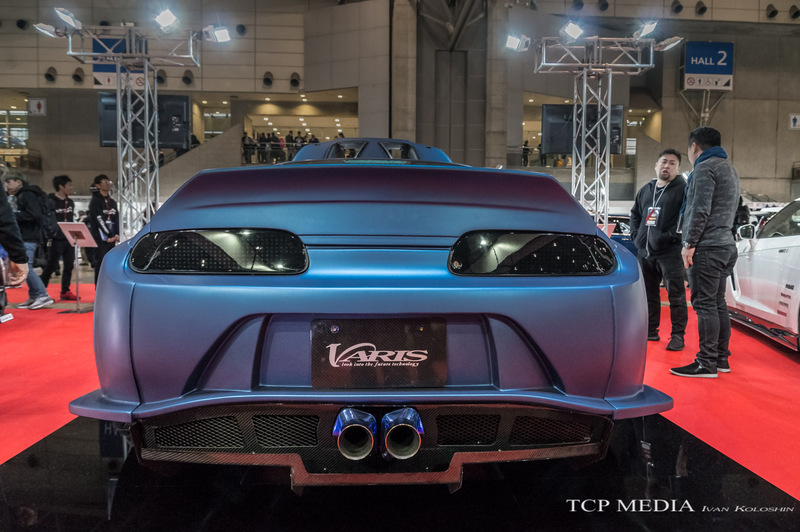 But this Supra is something from another world, a truly remarkable job job by Garage Revolver and Varis Japan. 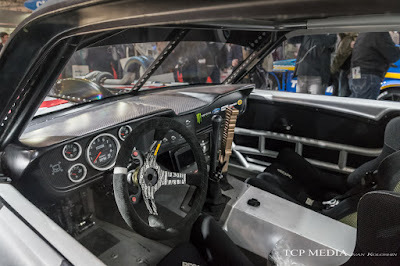 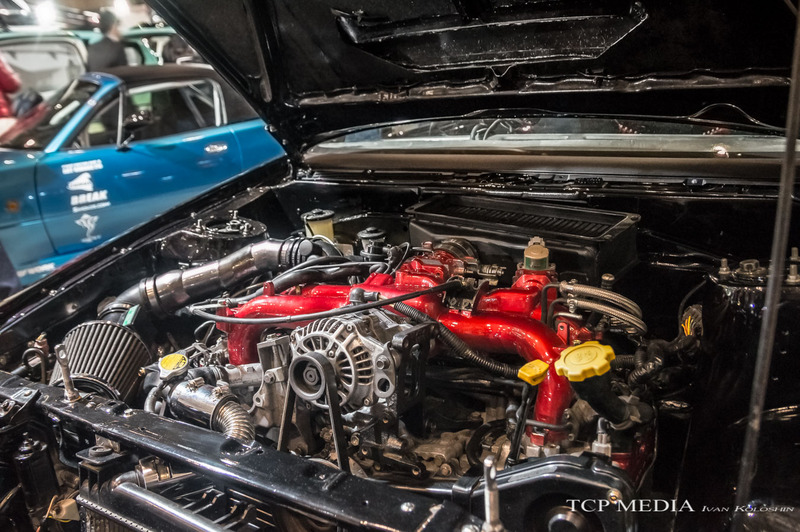 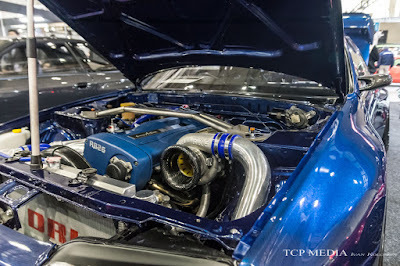 The machine was equally impressive under the hood with displacement bored-up to 3100cc and fitted with HKS T88 turbo, custom headers, cams, and specially build by DoLuck throttle-by-wire system which combine well to modernize the car. 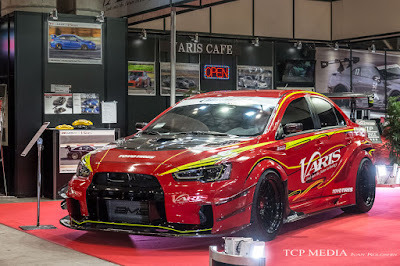 While we are on topic of international markets, this left hand drive Mitsubishi Evolution X Final Edition was brought to Japan by Bulletproof Automotive after being displayed at lats year's SEMA show. 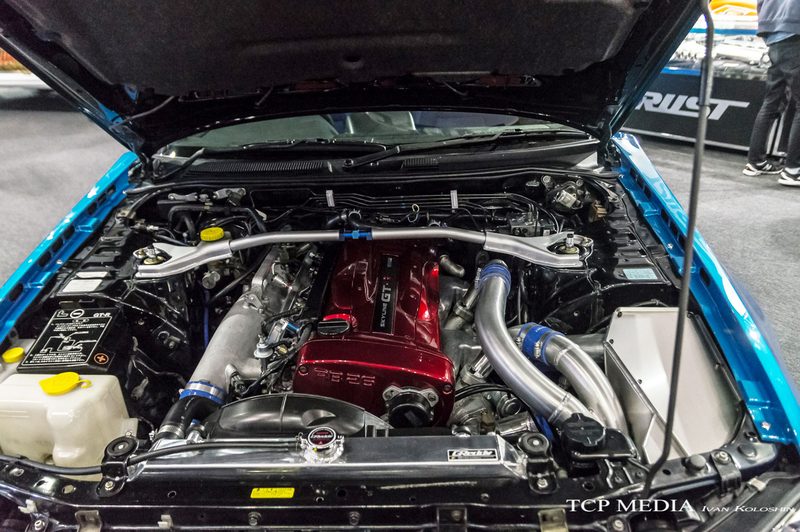 Sporting 2.2L stroker kit from AMS and Cobb turbocharger this EVO X is one of a kind project and is a true indicator why we are missing Mitsubishi Lancer Evolution being in production so much! 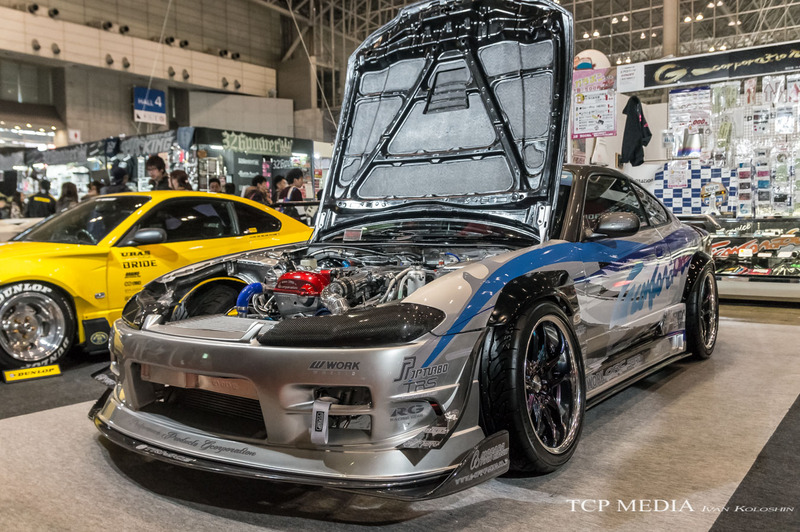 Another thing we miss is the Rotary engine. While lo longer produced it doesn't stop RE Amemiya to continue being the exclusive portal for all Japan's Rotary needs. 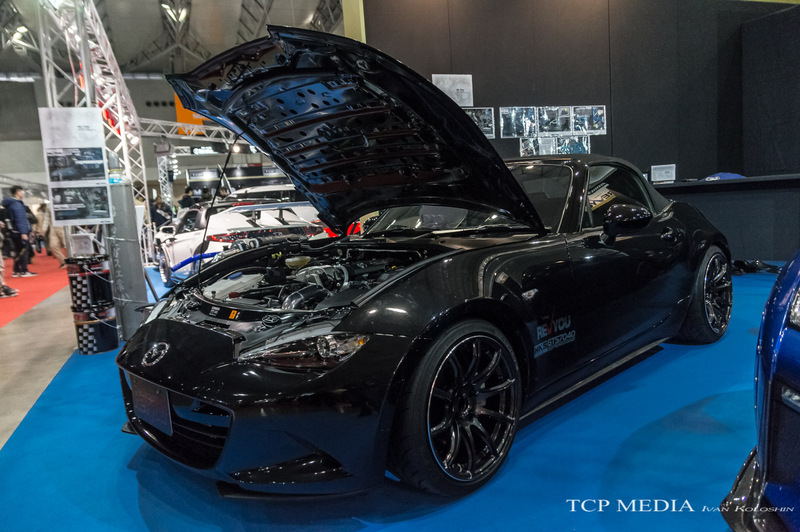 Located at exactly same spot at every single Auto Salon RE Amemiya meticulously perfects and extends lives of rotary engines around the country. 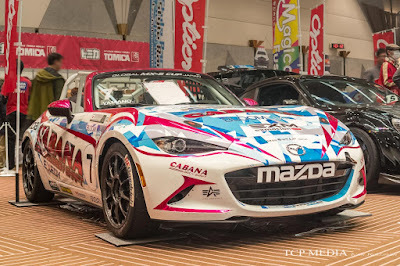 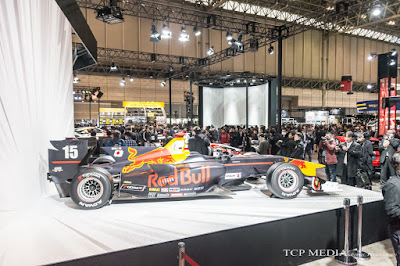 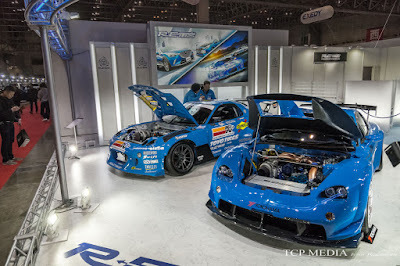 If there is only one reason why Mazda should consider reinvesting in this platform it is this shop, because Tokyo Auto Salon without RE Ameiya projects would just never be the same. 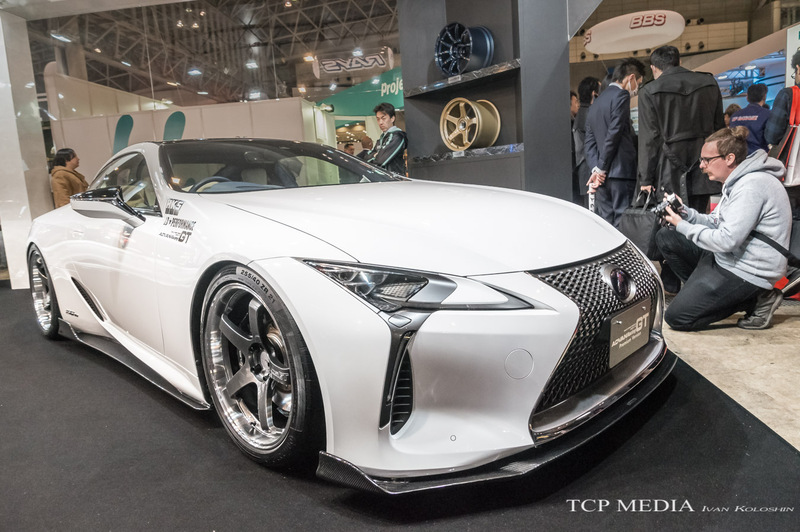 But perhaps it's just a vicious cycle of life, while one platform loses its might, it is inevitably replaced by another and right now ZN6 chassis is definitely most popular due to inedible potential , simplicity, reliability and relatively low cost. 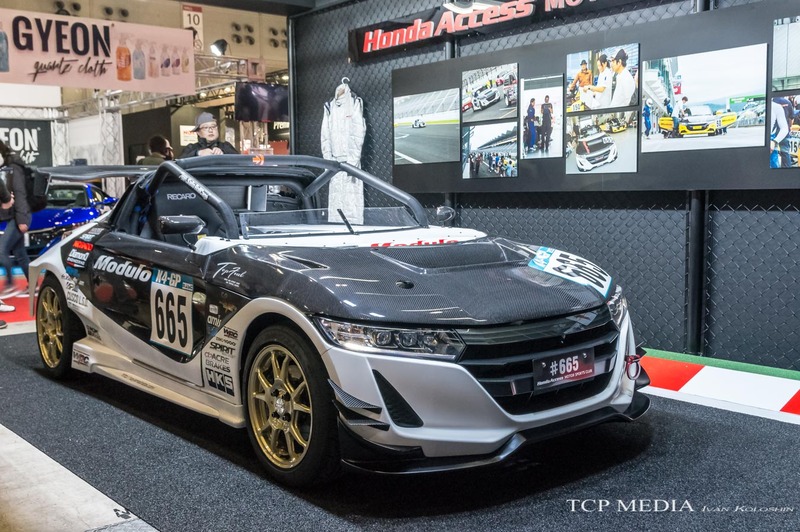 We start with the HKS TRB-03 - the Tsukuba circuit record breaker, running 0:50:259 this is the fastest and most powerful 86 with original FA20 engine. 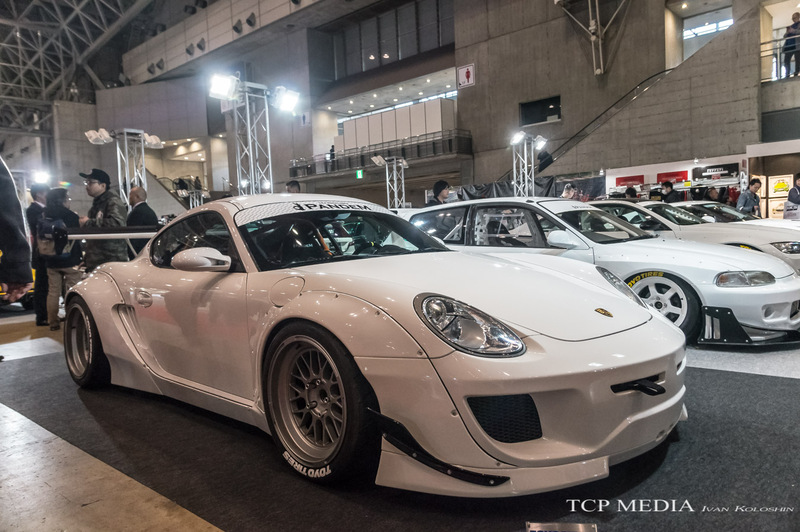 Bored and Stroked to 2.5L and fitted with GT3T5R Turbo it pushes out 760HP! 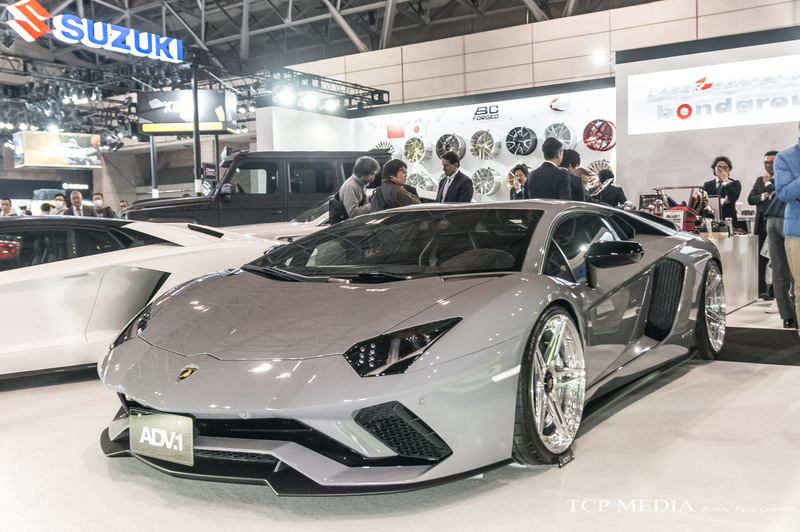 With state of the art Aero this car is epitome of no holds barred performance. 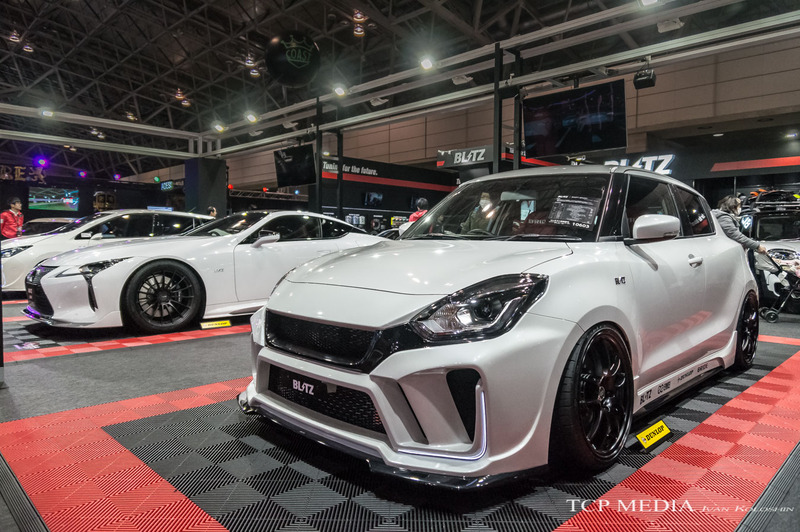 This brutal ZN6 86 sporting an INGS kit packs a whooping 555HP from stock motor with help of 2.1L bore and G'reddy TD06SH25GI turbocharger. Top speed - estimated 320kph! Subaru's turbocharged EJ20 motor should be an ideal fit for the old AE86 due to light weight and low center of gravity. and a set of TE37 wheels! While walking around the hallways, this thing caught my attention proving that virtually every car can be turned into a track orientated project, or at least look like one. 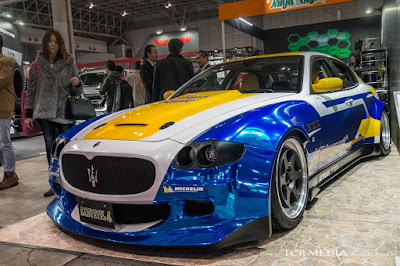 Fitted with goodies such as Recaro buckets and Nardi steering wheel this Maserati Quatroporte should be one hell of a machine to throw around a track, and if anything it surely sounds great! 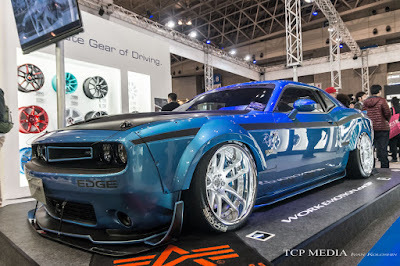 Air suspension suggest more show than go, but owner says "I don't care"! 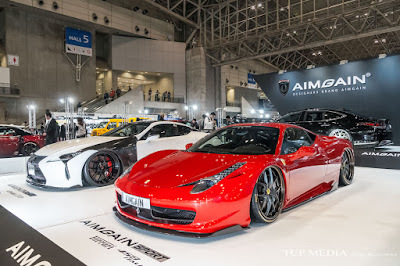 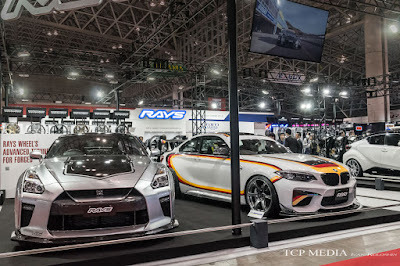 It is also interesting to see how seriously Japanese manufacturers are taking Auto Salon right now. 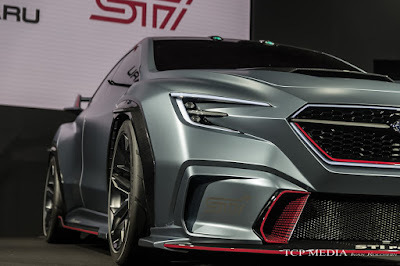 With massive booths by Toyota, Nissan, and Honda, albeit nothing operatically interesting from the above two, it was Subaru that presented a true eye candy and perhaps most desirable concept car ever. 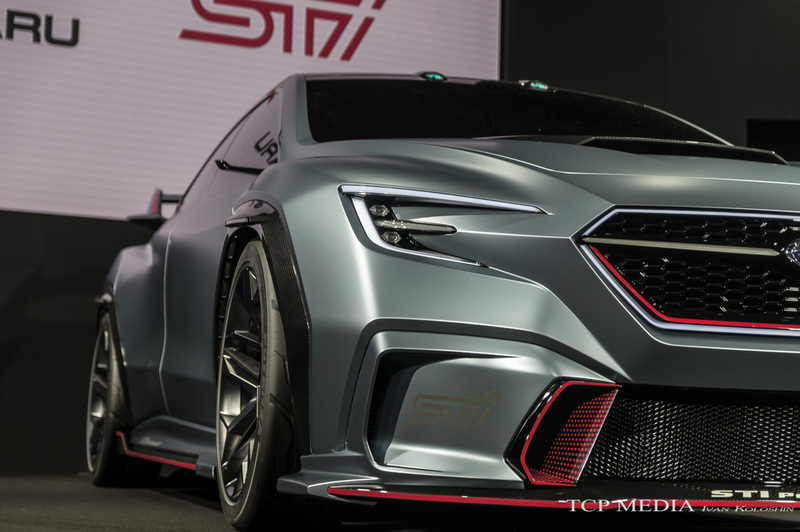 Viviz concept was unveiled at Tokyo Motor Show as collection of ideas for next generation Impreza, but Tokyo Auto Salon received the STI Performance version fitted with wide fenders, aerodynamic package, and 19 inch forged wheels, seriously wetting fans's appetites. 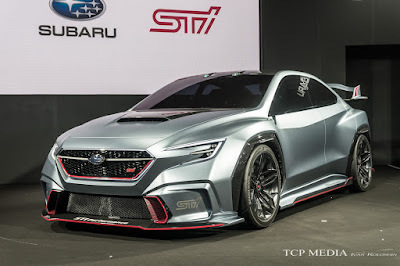 While it is almost a guarantee that this concept, just like all others in Subaru's illustrious history won't see the light of day, I would like to add a positive note stating that Subaru is committed to work with STI to enhance their vehicle lineup, and if not the whole package, even if some design clues from this concept vehicle make into into the future Subaru vehicles we may actually see a Subaru eye candy. Just hope it will not have a bloody CVT. 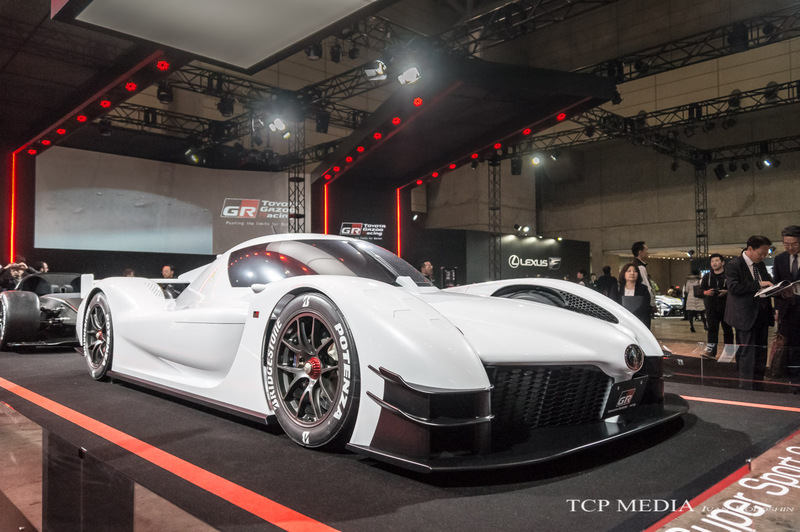 What effectively is Toyota's Le Mans racecar is said to have 986HP, from combination of 2L V6 Turbocharged engine and complex electric drive-train. 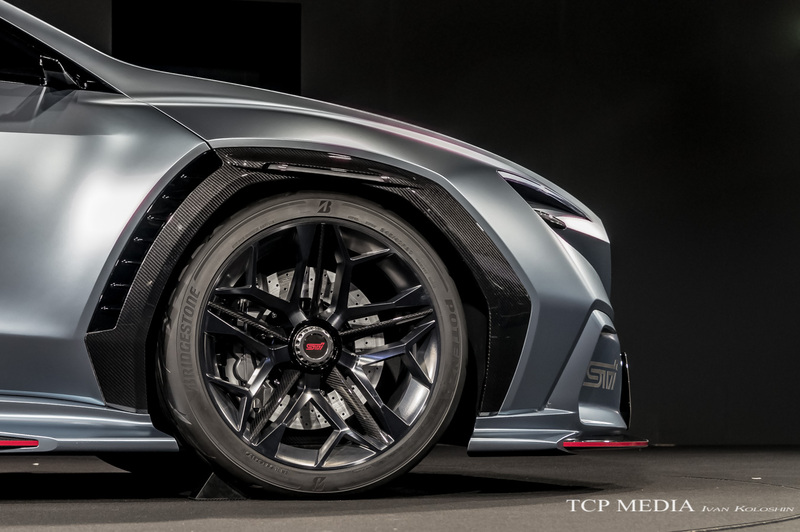 Sporting full carbon chassis it is perhaps Toyota's answer to AMG Project 1. 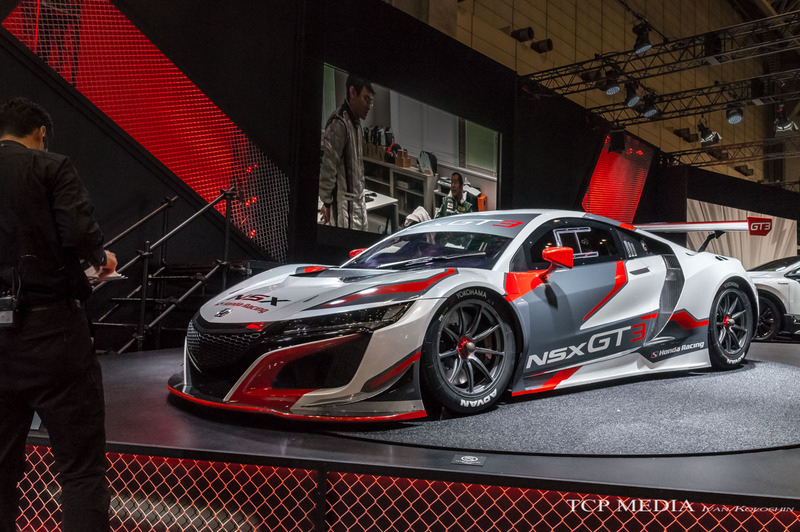 Regardless if this will be branded under GR or Toyota, a hypercar from a Japan is never a bad thing. 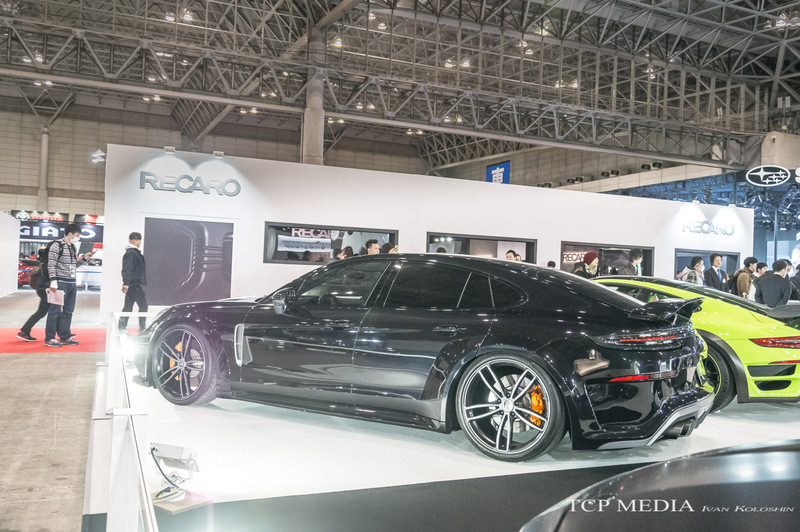 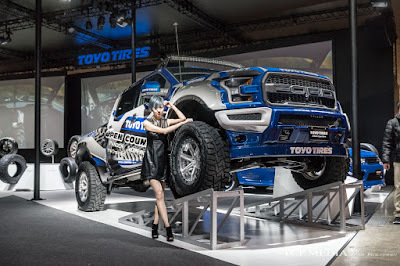 On this note, I will conclude this part of the coverage of 2018 Tokyo Auto Salon. 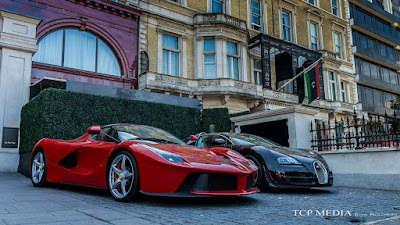 Please scroll down for more pictures of some of the awesome cars from the event and check back soon for BMW special post.